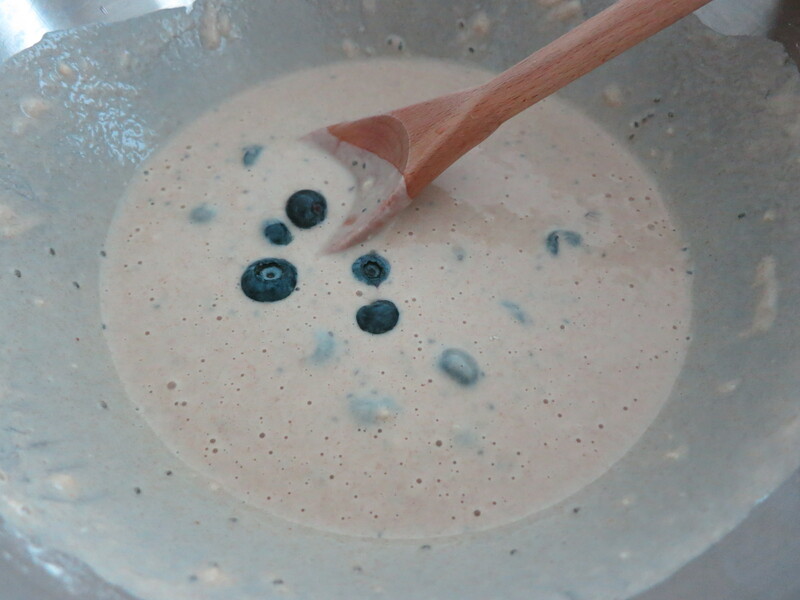 I wanted to make this recipe healthy so I added blueberries and chia seeds along with spelt flour. 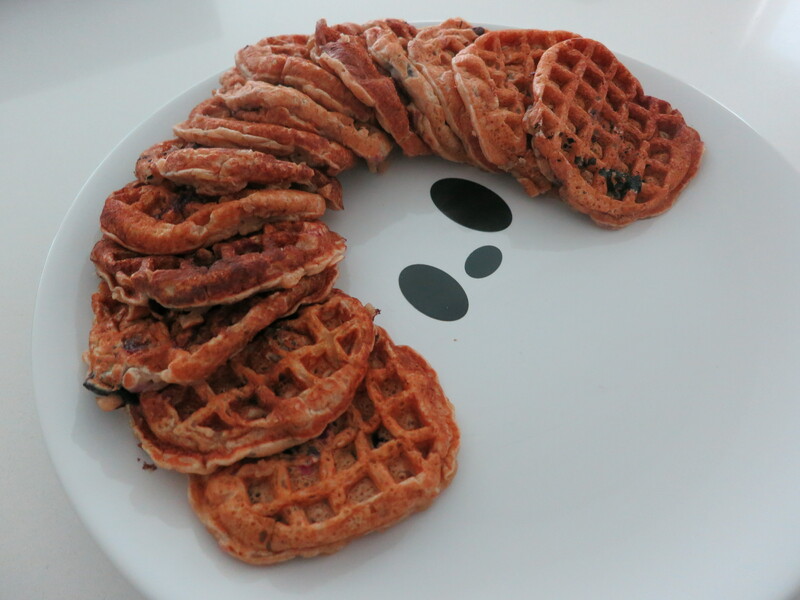 The pancake waffle itself was soft reminiscent of a pancake and it was light and fluffy. I loved how the blueberries burst in your mouth and the chia seeds give it a whole different taste. There’s a little crunch from the chia seeds which contrasts the soft pancake. I squashed a few blueberries into the mixture on purpose to try and get a blue hue from the blueberries but I couldn’t really notice the difference after I had cooked the pancakes. 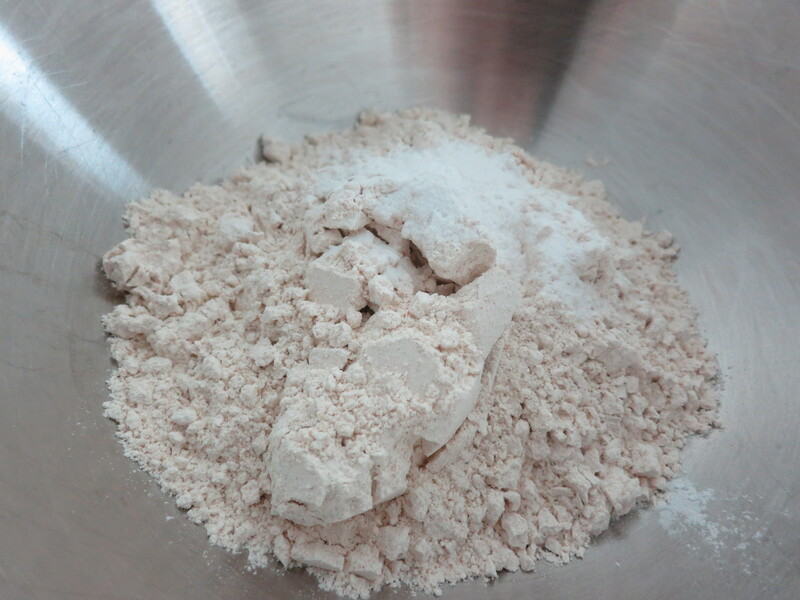 Mix all your dry ingredients together (spelt flour, baking powder, cinnamon and salt) in a big bowl with a wooden spoon and set aside. 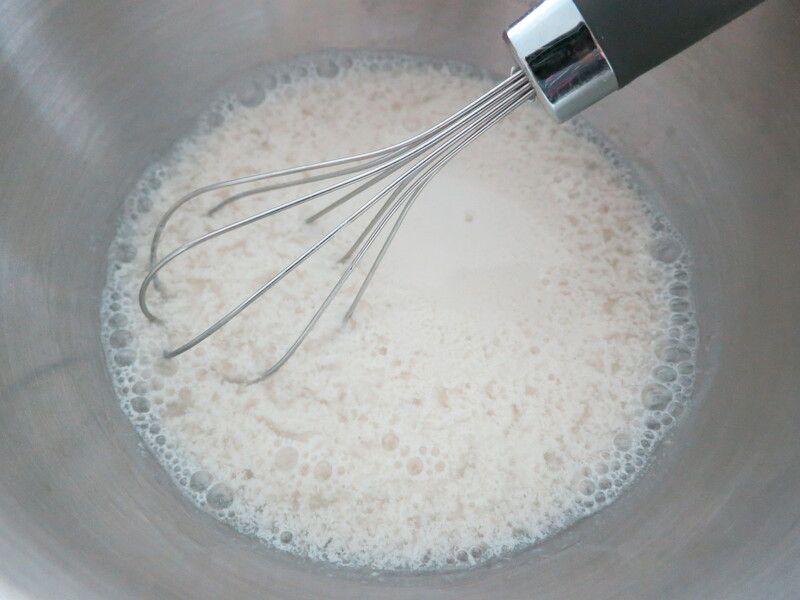 Mix the apple cider vinegar with the soy milk in a small bowl and let it curdle for a few minutes to create your vegan buttermilk. 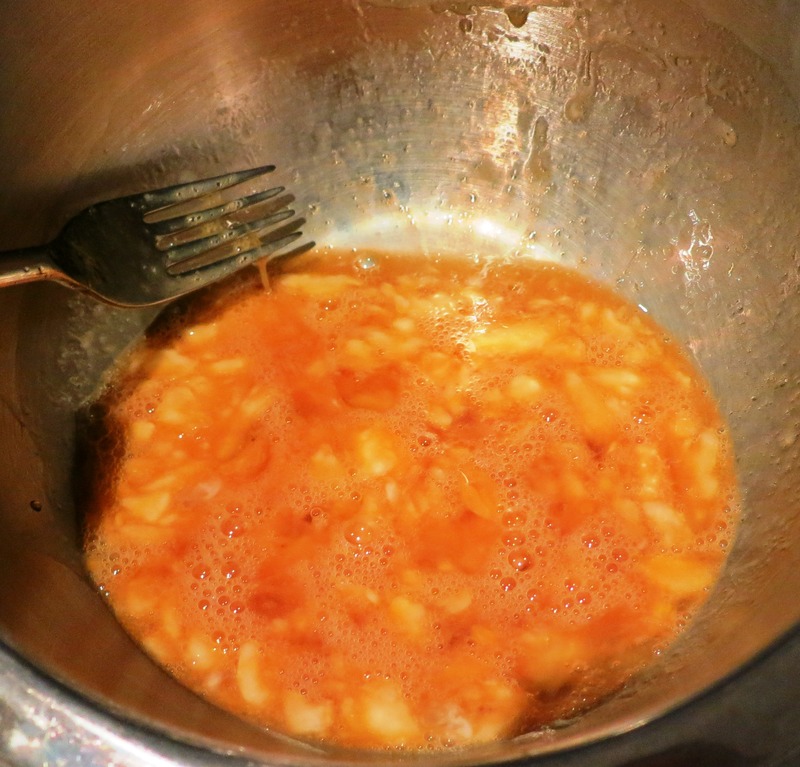 Add in the maple syrup and the coconut oil into the milk mixture. 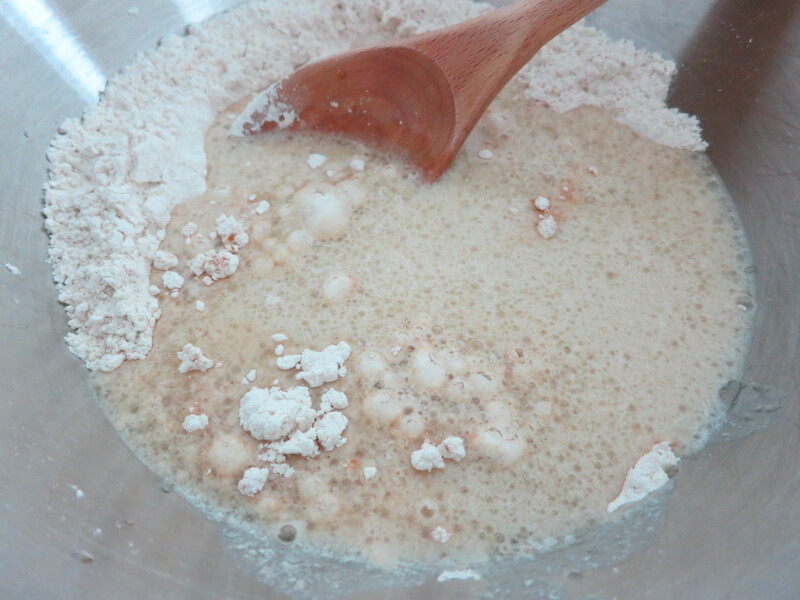 Mix your dry ingredients with your wet ingredients to form the pancake waffle batter. 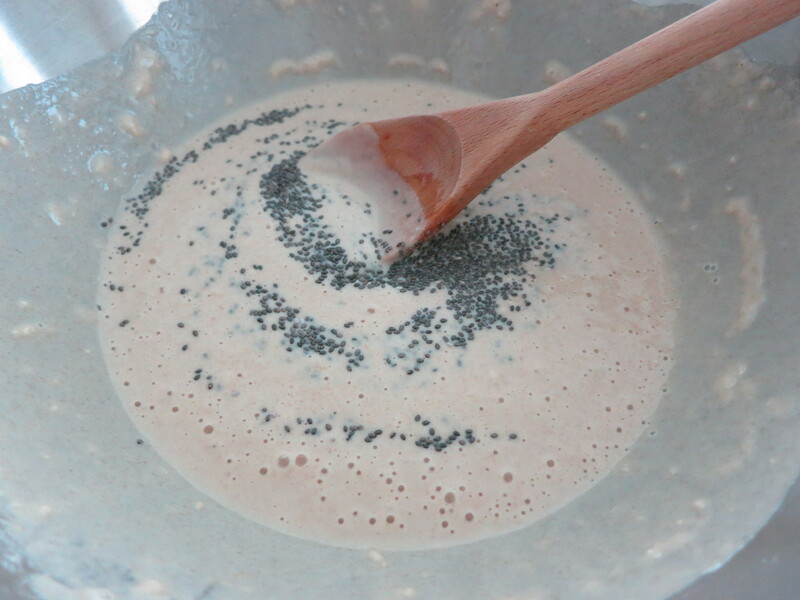 Add in the chia seeds and the blueberries and fold them into the batter. Heat up a crepe/pancake pan (I used a pancake waffle pan) with a bit of oil. Spoon a big tablespoon of the batter into the pan (I used an ice cream scoop) and let it brown for a few minutes until bubbles start forming on the top of the pancake waffle. 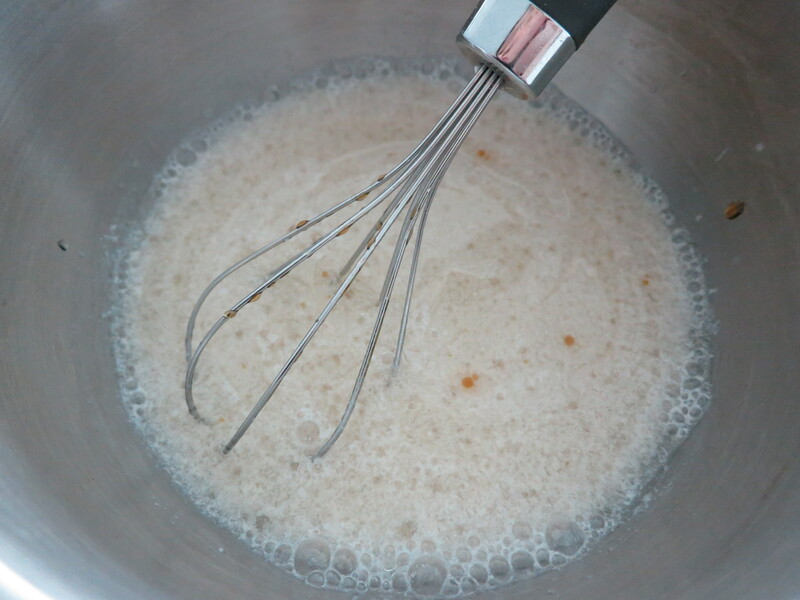 Once the bubbles have appeared, flip your pancake waffle and cook the other side for a few minutes. 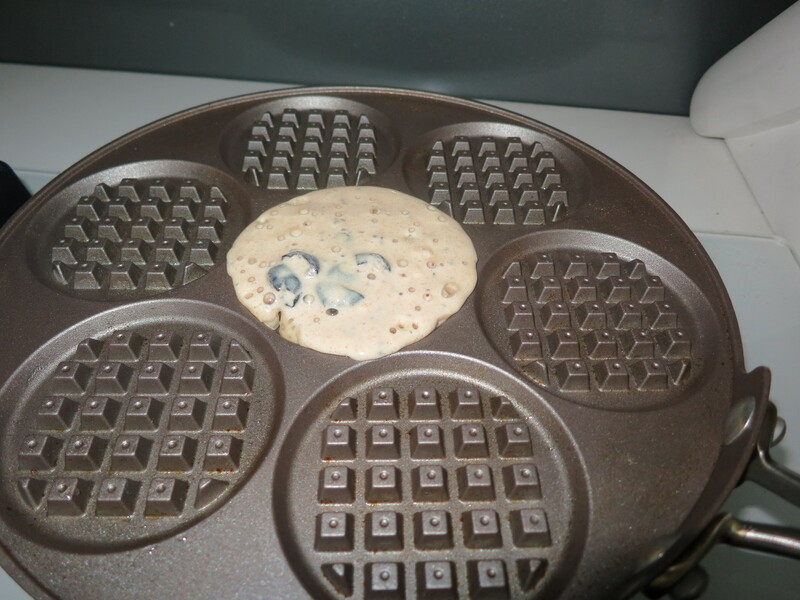 Rest your cooked pancake waffles on a plate while you repeat the cooking process until all your batter is finished. 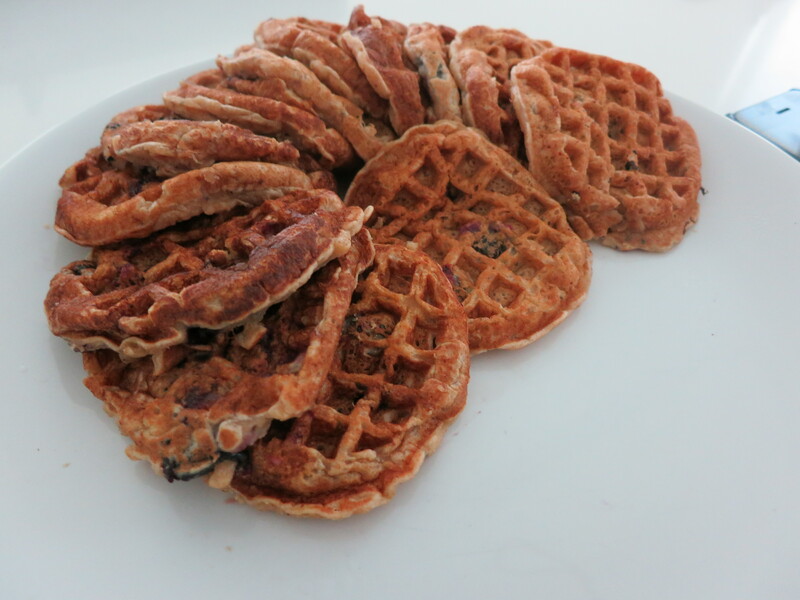 Enjoy your pancake waffles with pure maple syrup or with some chopped fruit. Happy Wednesday! 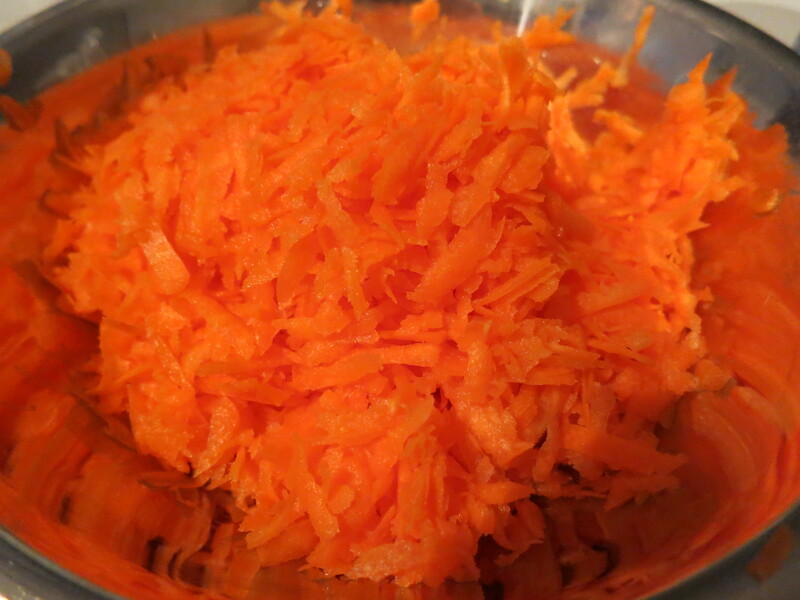 Wednesday means it’s time for a new recipe post. Sorry for the delay in posting but it’s been another busy week and after all the birthday celebrations, I have come down with the cold and flu so have been trying to overcome the sickness despite lacking quite a bit of sleep. 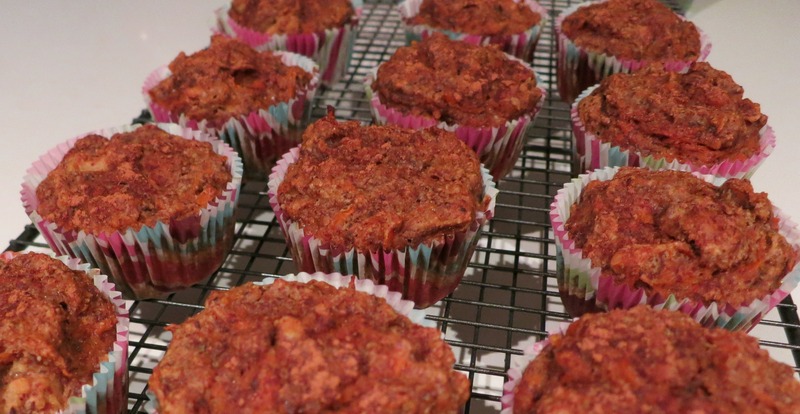 I baked some gluten-free paleo carrot cake muffins for Mr Muscles last week for his birthday. 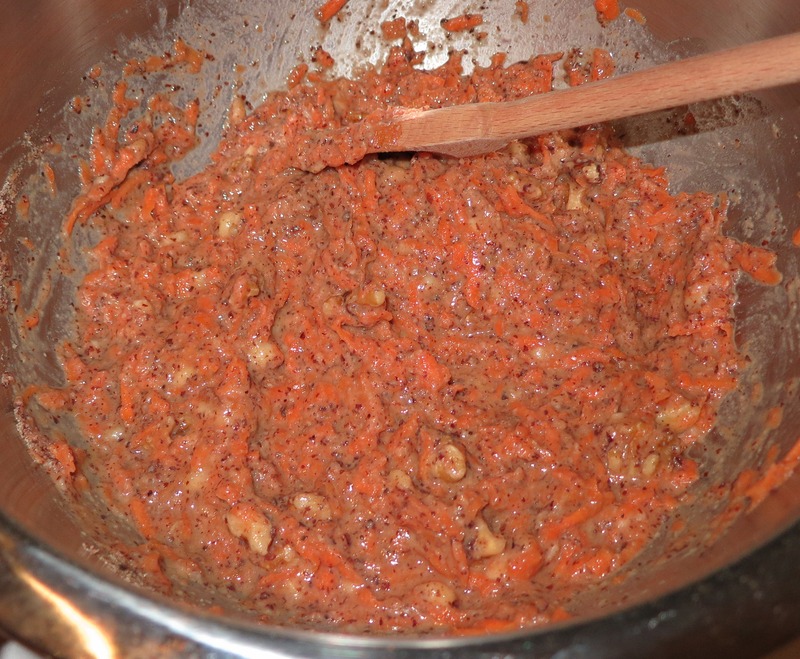 Mr Muscles loves carrot cake so I knew I wanted to bake carrot cake and I thought why not make them into muffins as then he could share them with all his friends and workmates on his birthday. I searched on the net for a few recipes as I’m only starting to bake paleo as I can see a new trend towards this and more and more people seem to be interested in eating paleo. 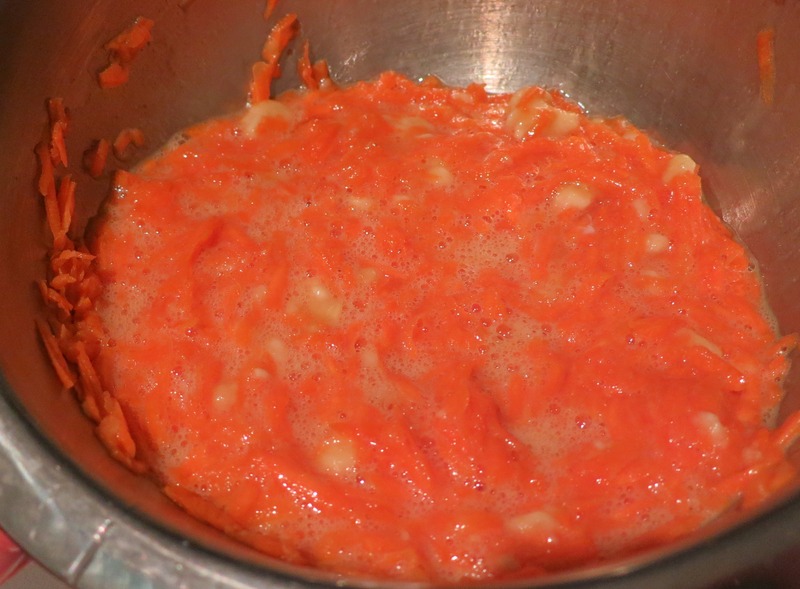 I found this recipe at Multiply Delicious (http://www.multiplydelicious.com/thefood/2011/08/gluten-free-carrot-muffins/) and adapted the recipe from this. I wanted to bake the muffins using my natural blanched almond meal so I just subbed this in for the almond flour in the recipe instead. Mr Muscles put these on a plate for his co-workers to try and he told me that once he went back to the kitchen, they were all gone. Always a good sign when a plate full of muffins disappears in no time at all. I can safely assume that his coworkers enjoyed the muffins. Mr Muscles even checked the rubbish bin to see whether anyone had chucked out the muffins but upon inspection, he noted that there were no appearances of muffins in the bin. 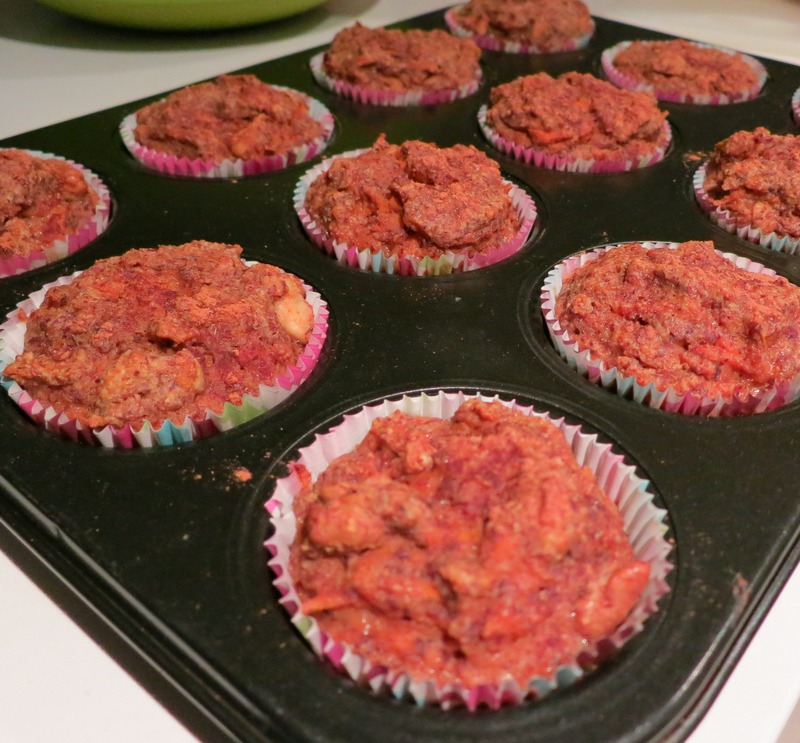 I’m definitely going to keep trying different paleo recipes to mix things up a bit and Mr Muscles seemed to really like the muffins so I was more than happy that they were enjoyed by the birthday boy himself =). Line your muffin tray with muffin cups and set aside. 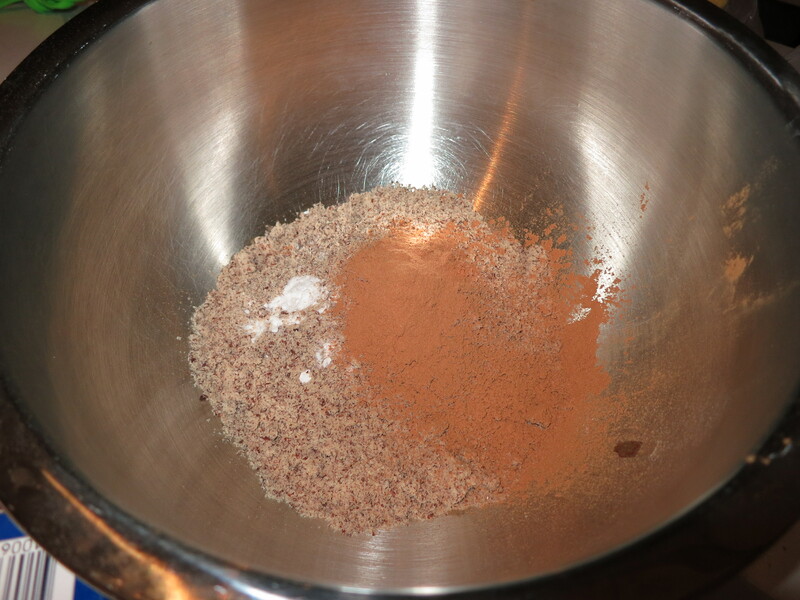 In a large bowl, combine all your dry ingredients together: almond meal, baking soda, cinnamon and salt together and set aside. 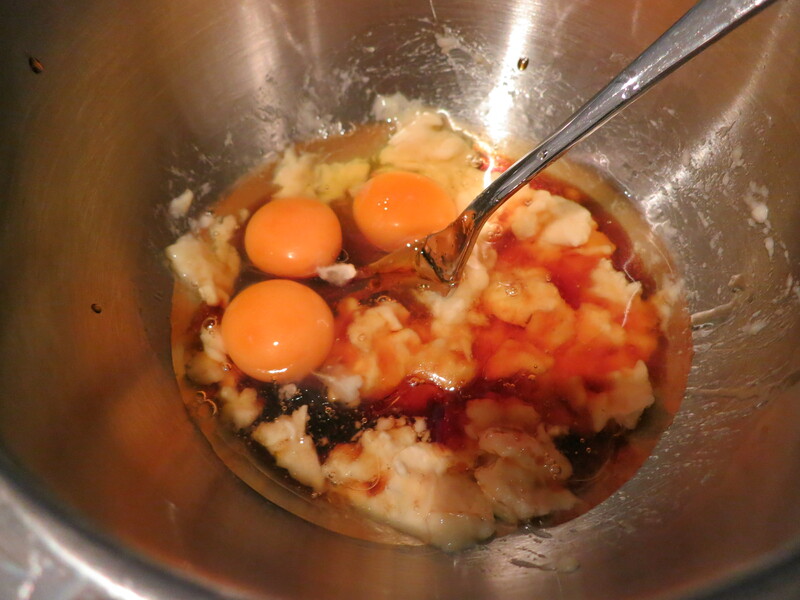 In another bowl, mix your wet ingredients: eggs, oil, mashed banana and maple syrup and whisk until combined. 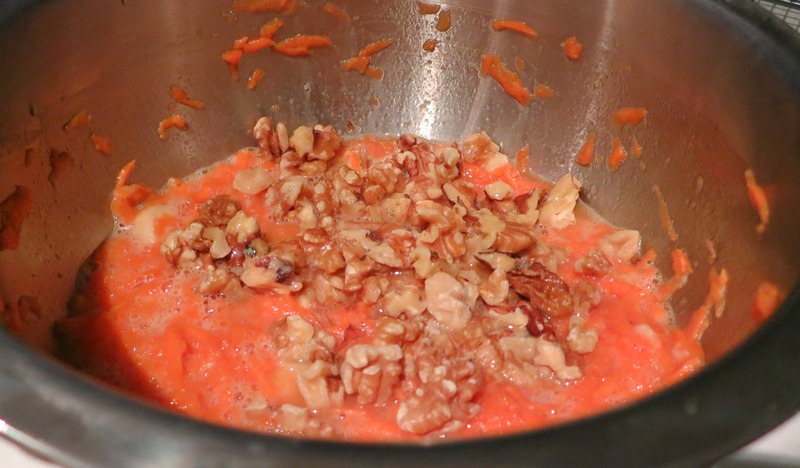 Add in your grated carrots and walnuts into the wet ingredients mixture until just combined. Using an ice-cream scoop or a large spoon, fill up your muffin cups 3/4 full and then add a bit of cinnamon to the top of each muffin. Bake your muffins for around 25 minutes. Take your muffins out of the pan and let them cool on a wire rack. But back to what this post is really all about…Mr Muscles birthday! Mr Muscles birthday was a few days ago but due to my basketball final coincidentally falling on the same day of Mr Muscle’s birthday, we decided to do a belated birthday dinner the next day to celebrate. 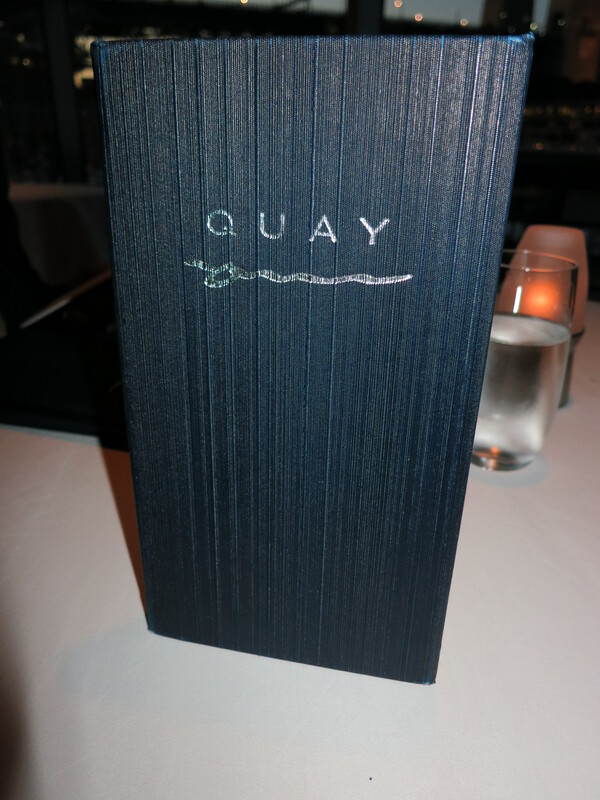 Mr Muscles and I had never dined at Quay before so we decided that this would be the perfect opportunity to celebrate his birthday dinner there. I really couldn’t wait as I had seen so many people visit this restaurant and obviously hearing about the infamous snow egg, I knew I had to try this to see what the hype was all about. 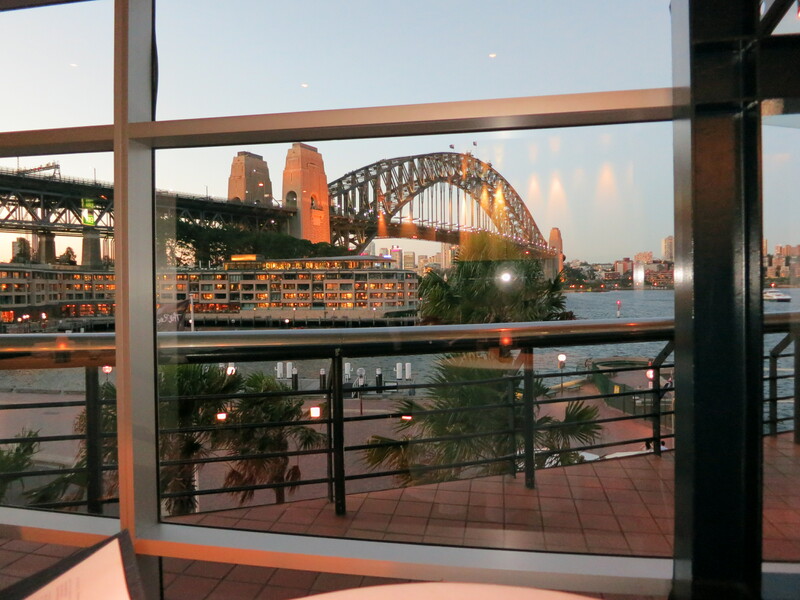 We arrived at Quay on time and we were seated in a lovely isolated area over looking the Rocks area. 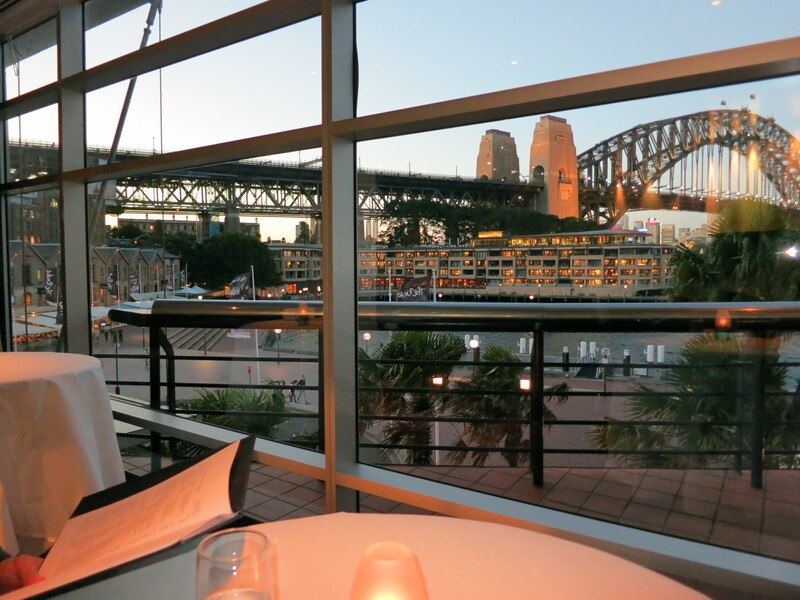 We had been seated here due to a massive cruise ship blocking most of the view that you usually get when you dine at Quay. We were seated next to another couple who were celebrating their anniversary so there were definitely celebrations all around. 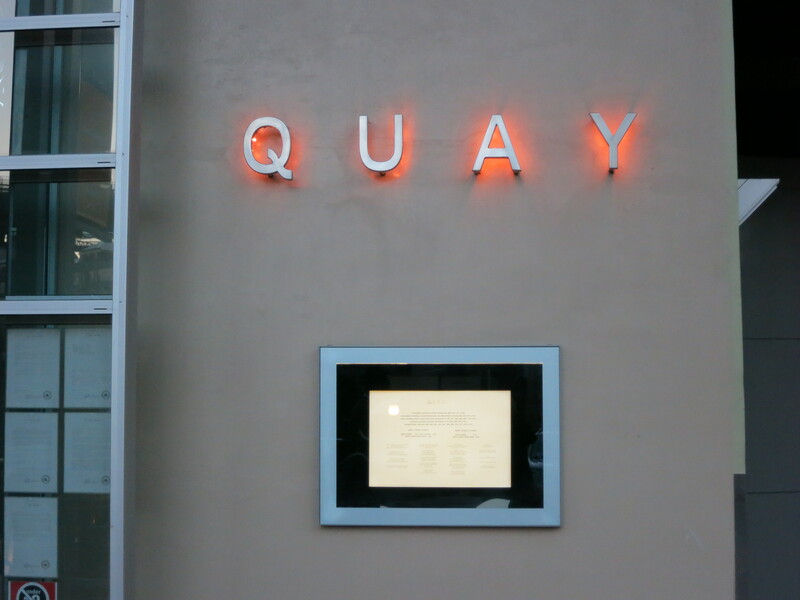 I thought the service at Quay was really impressive. 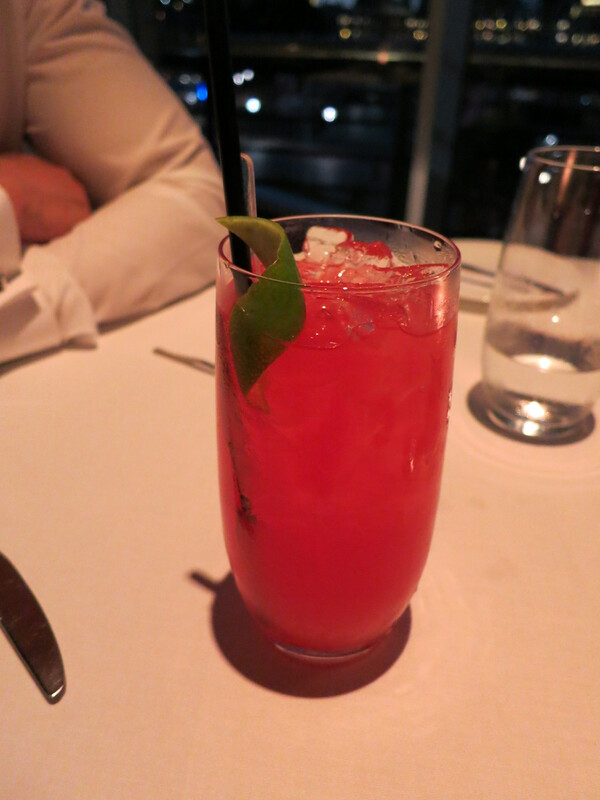 We had a wonderful waitress who was very attentive and informative about certain dishes. She really made the night that much more enjoyable and even offered to take our photo a few times with our desserts. We were given a complimentary box of chocolates for Mr Muscle’s birthday which I thought was very nice and thoughtful. Mr Muscles and I decided that we wouldn’t go for the tasting menu of 8 courses and instead we opted for the 4 courses at $175/person. 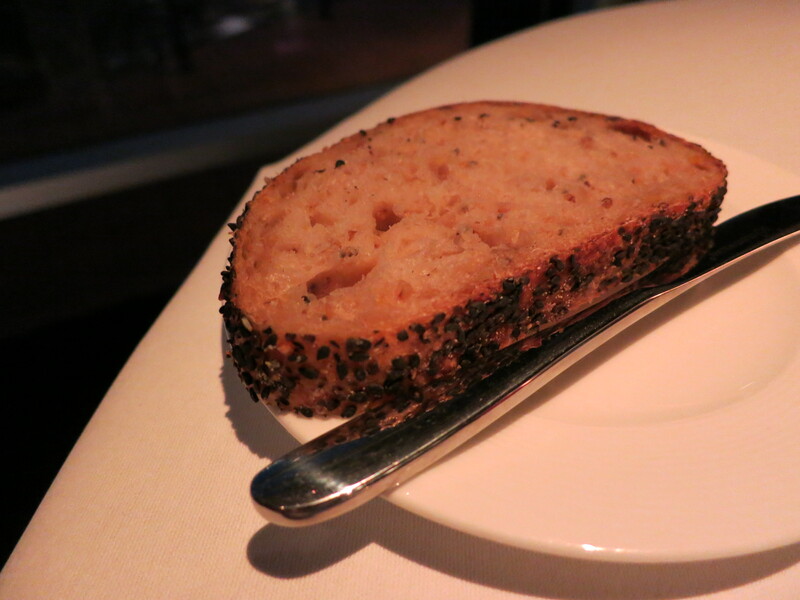 There was a large selection of sourdough bread to choose from but since I didn’t want to end up being too full once the food started coming out, I just settled for the one piece. Mr Muscles chose the poached chicken for his first course. 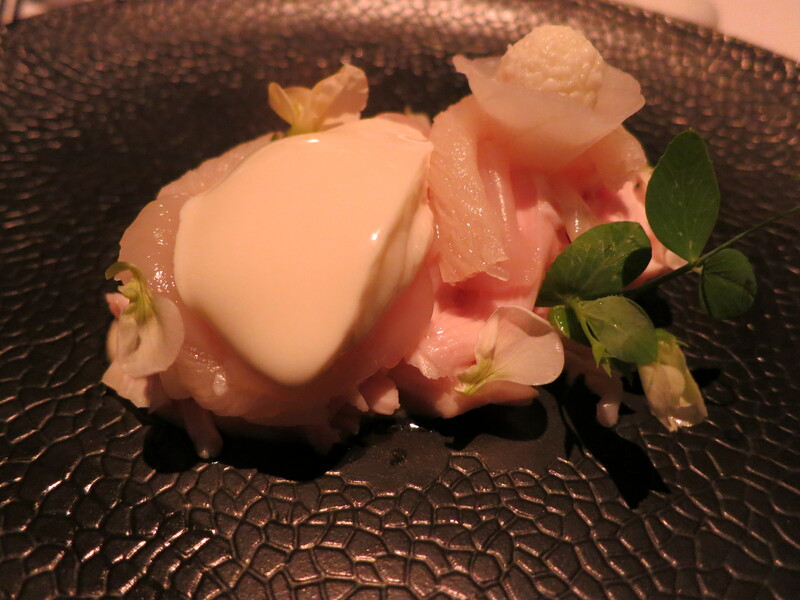 He really loved the dish as it reminded him of a modern take on Hainanese chicken. The chicken was wonderfully poached and soft that melted in your mouth with each bite. The scallops worked wonderfully with the chicken. I tried a little bit of Mr Muscle’s dish and agreed that this was really a lovely dish. The ingredients just all seemed to work well together and each component provided a different taste and texture with each bite. I really loved this dish and definitely thought that this was the stand out of the savoury dishes I ordered for the night. 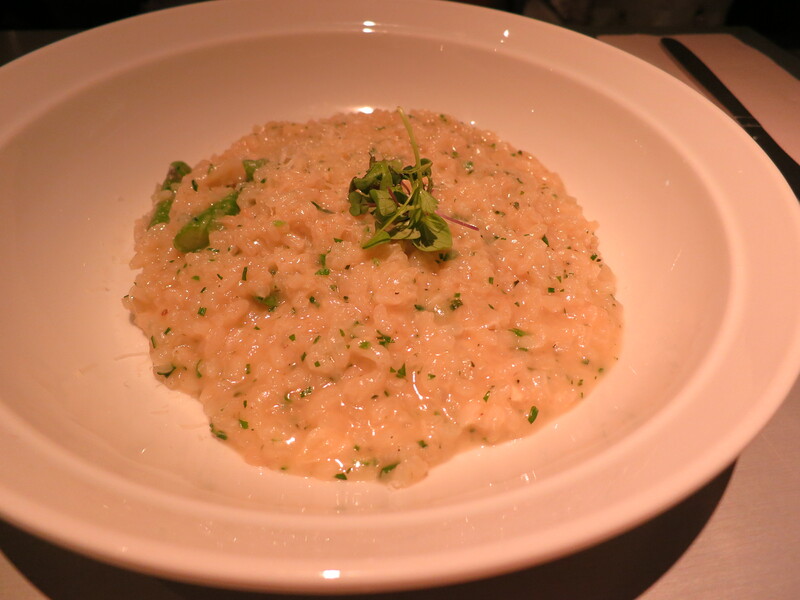 It really reminded me of congee from childhood but with a bit of a modern twist to it. 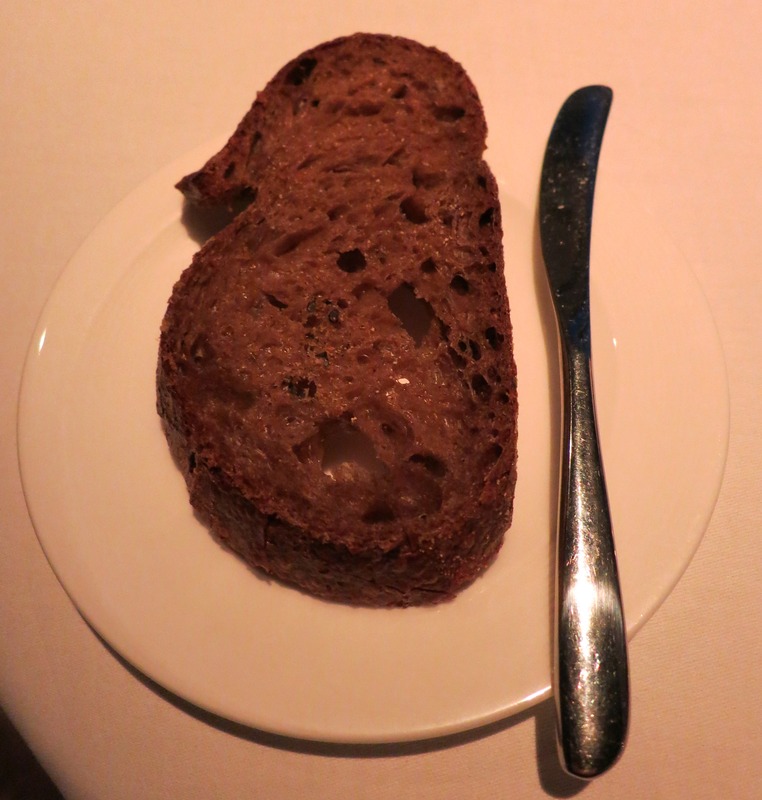 The crab was lovely and soft against the firmer and crunchier palm heart. The egg yolk emulsion just brought the whole dish to another level. I only wish that there had been more of this congee for me to eat. In a matter of minutes, the congee disappeared right in front of my eyes and I only wished I had eaten it at a much slower pace. The waitress mentioned after she was clearing the plates that this has been a signature dish on the menu at Quay for more than 10 years and I can understand why. 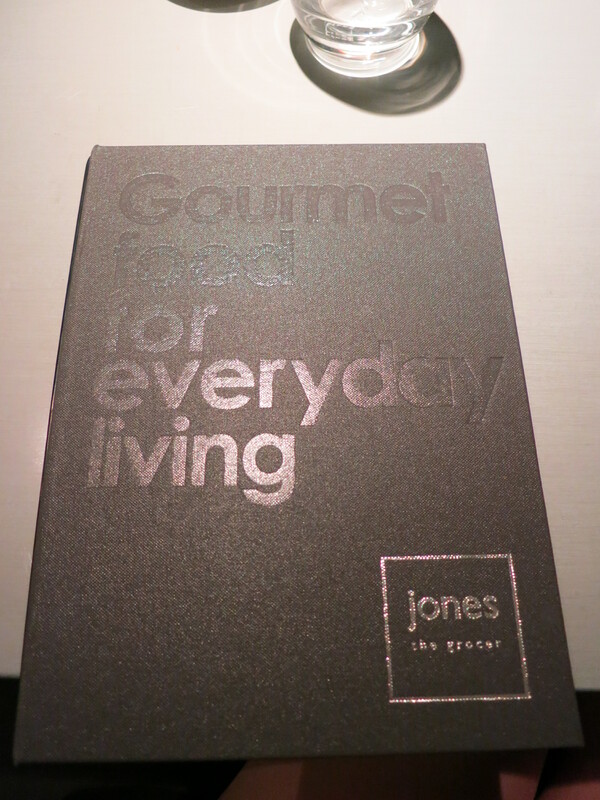 Definitely a must order when dining here. Mr Muscles ordered the abalone for his second course and what looked really interesting on paper somehow translated into something he wasn’t really expecting. Mr Muscles probably enjoyed this dish the least out of all his dishes. Though I didn’t try this, he told me that the flavours were all very unique but somehow didn’t really go together. 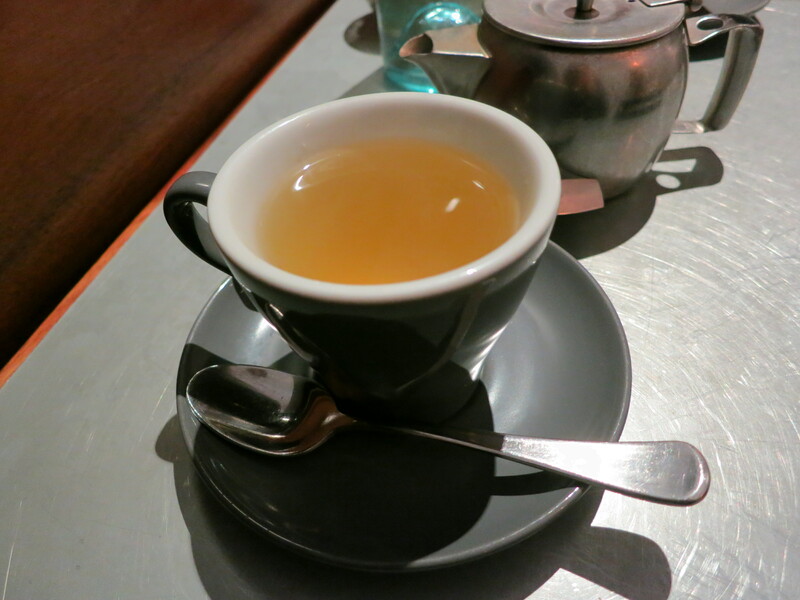 What I did love was the way the dishes were presented for our second courses where a tea-pot was filled with each of our broths and consommes and it was poured onto our dishes at the table. I thought that was a really nice touch in terms of presentation of the dishes. I really enjoyed my second course. 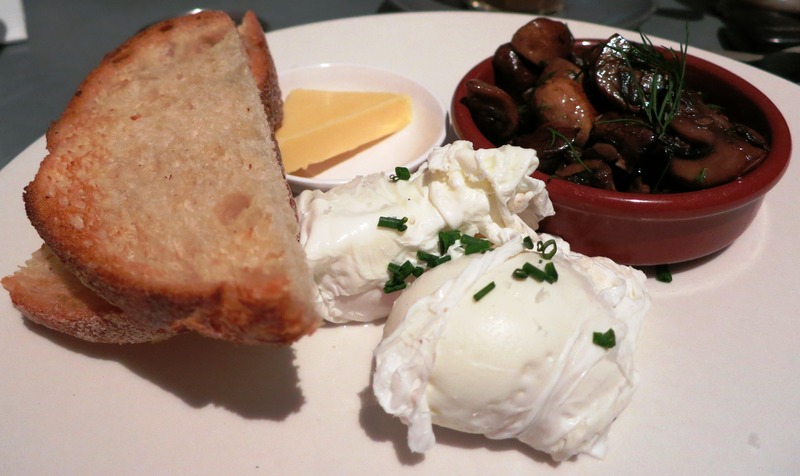 The waitress poured the consomme onto the picturesque layers of mushrooms. Everything worked so well together and I loved that each mushroom provided a different taste and a different texture in contrast to the smooth silky custard that was found at the bottom of the dish. 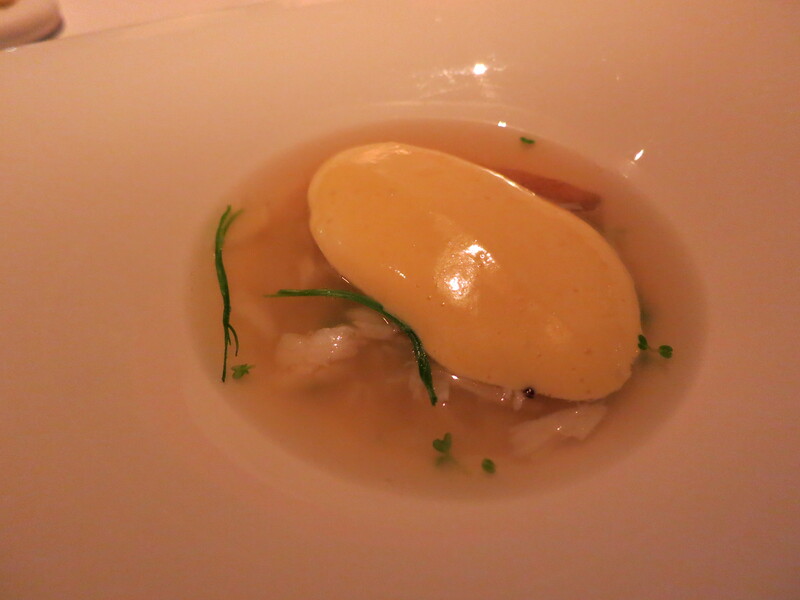 The Mushroom Consomme was light but really flavourful and you could really taste the mushrooms throughout the whole dish. 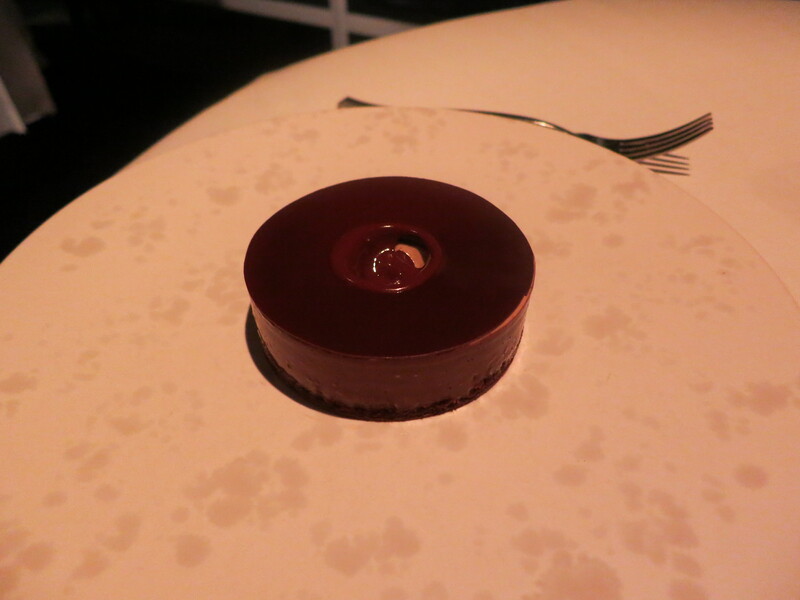 When Mr Muscles’ dish came out we thought it almost resembled some sort of chocolate dessert. Mr Muscles cut open the beef and inside you could see the very pink innards of the beef. 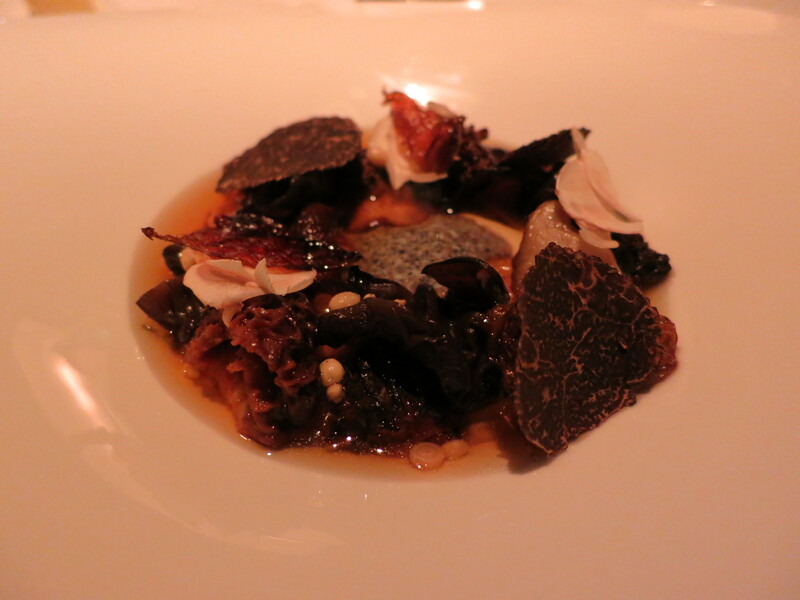 It was really amazing how the various flavours worked together to create such a clever dish. 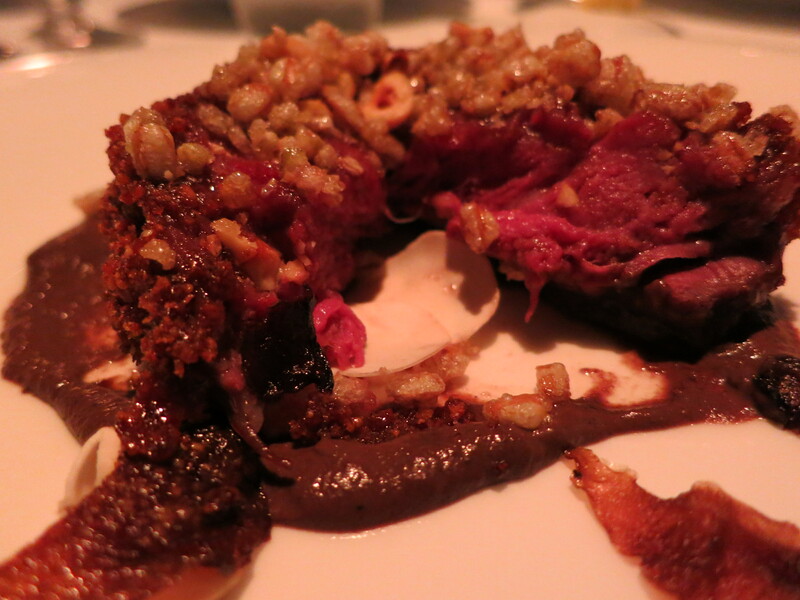 The chocolate, the crumbs and the mushroom all paired so well with the beef. Mr Muscles gave me a piece to try and I was so surprised at how tender and soft the beef was and how the crumbs on the outside of the beef gave it a really nice crunch. 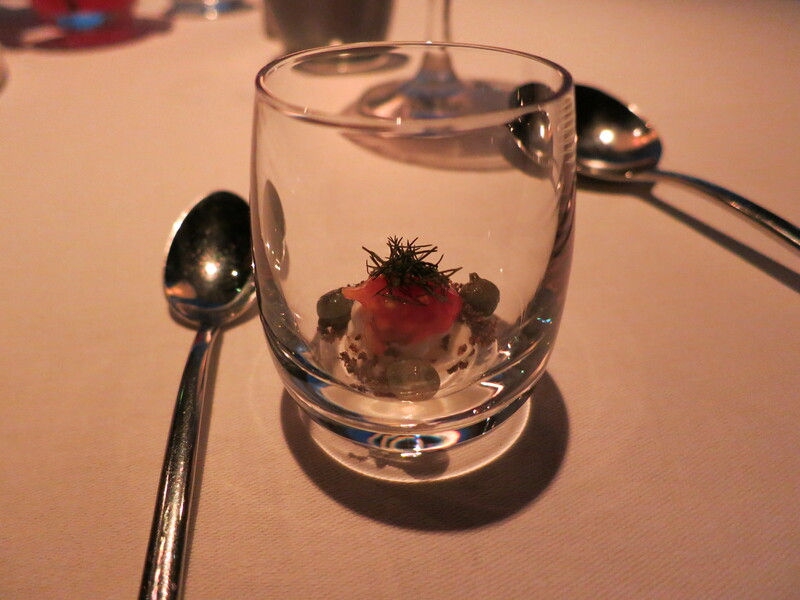 I really loved my third course as well. 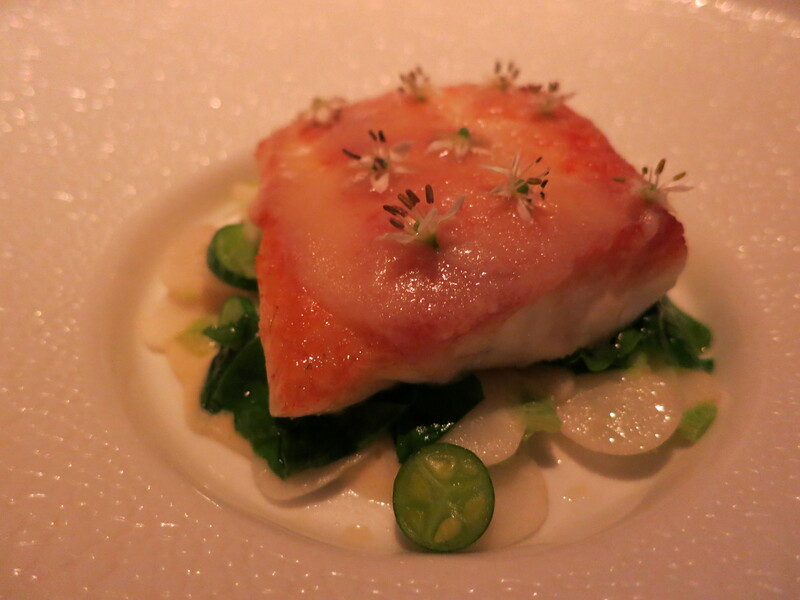 I usually love ordering fish for my main as I like eating a less heavy main and it provides me with more room for dessert naturally ;P The snapper was wonderfully cooked and it really melted in your mouth with each bite. The top of the fish was crunchy and the sauce added some lovely flavours to the dish. 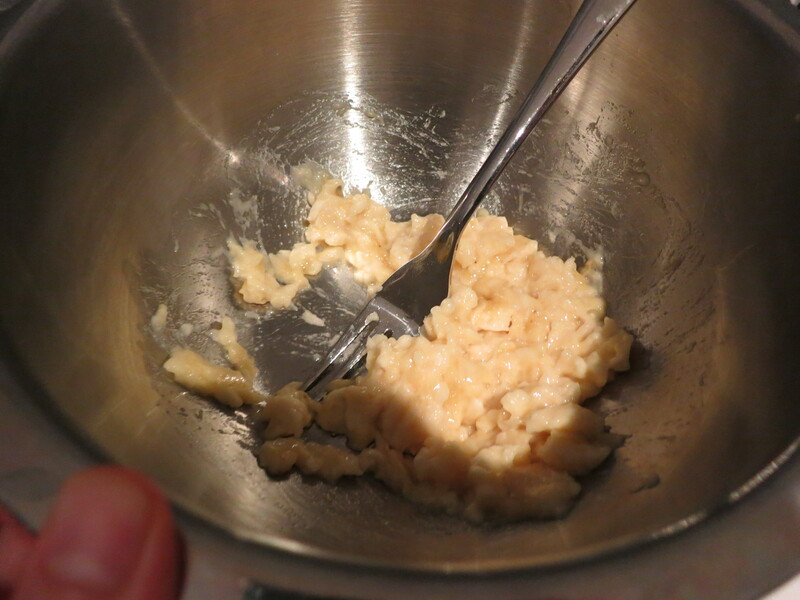 I liked that there was the crunch from the white turnips and the softness you got each time you bit into onions. 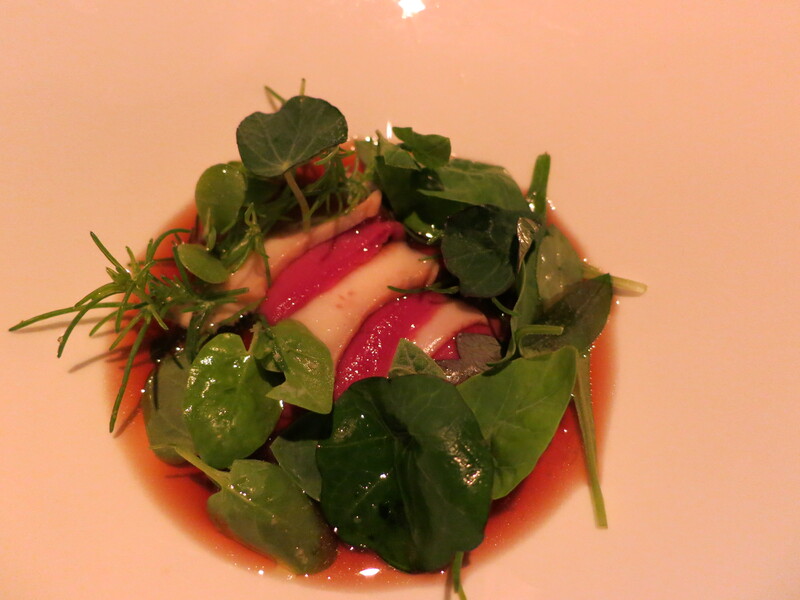 All in all, I thought this was a really wonderful dish. But now to the most important meal of the night: DESSERT!!! Mr Muscles ended up choosing the eight texture chocolate cake as he thought he should order something different to me. The snow egg had my name written all over it from the minute we sat down! ;P I think Mr Muscles had serious food envy when my snow egg came out and realised he probably should have also just ordered a snow egg. I loved the presentation of the chocolate cake where we watched the waiter pour in more chocolate to add to this already rich and indulgent cake. Mr Muscles dug into his dessert but stated that this dessert was very very rich and that it was hard to finish due to the richness of the cake and all the various layers of chocolate. 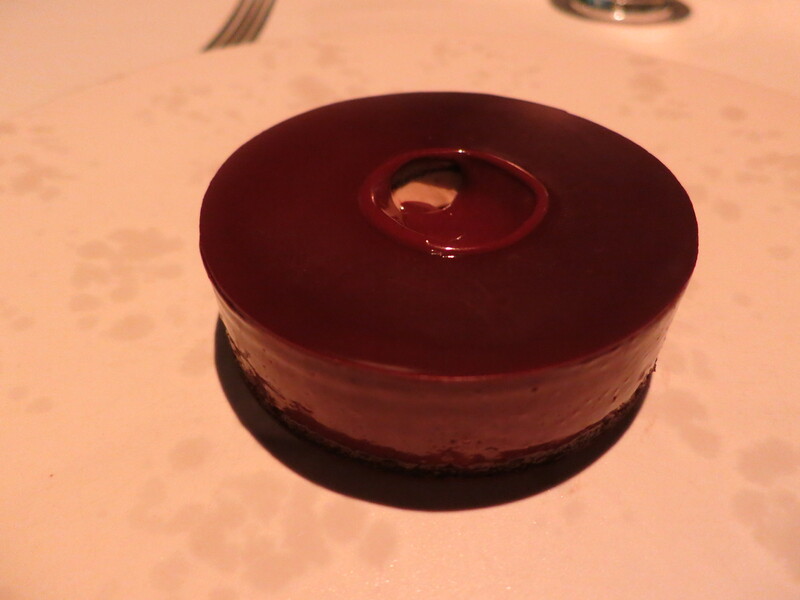 I tried a bit of the cake and agreed that it was very rich and quite bitter from the dark chocolate. 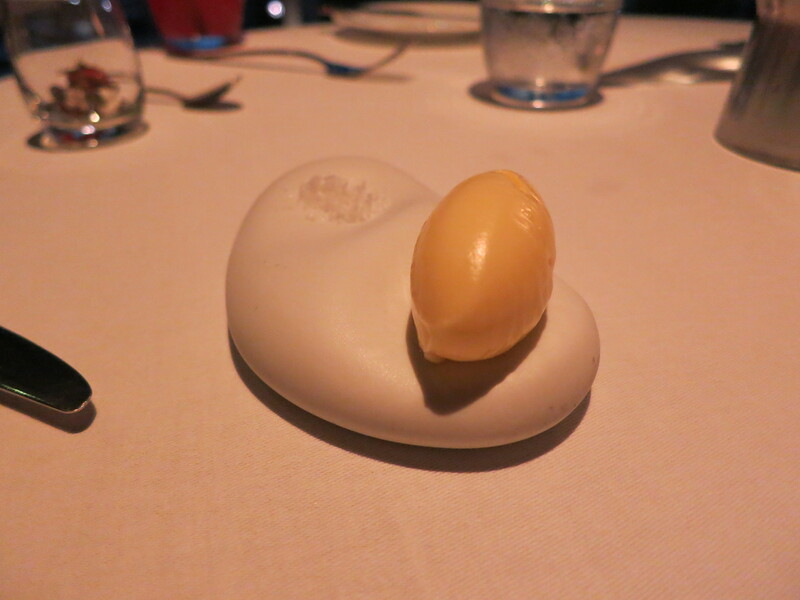 But drum roll please…..THE INFAMOUS SNOW EGG!!! I had read about the snow egg on so many various blogs and seen pictures of it from people who had visited Quay and had major food envy every time I saw a picture of this snow egg. I really couldn’t wait to try it! I know that each time the fruit flavour changes so it’s never the same. I’ve heard people eat snow eggs with peaches, nectarines and cherries so I was curious to see what plum would taste like. 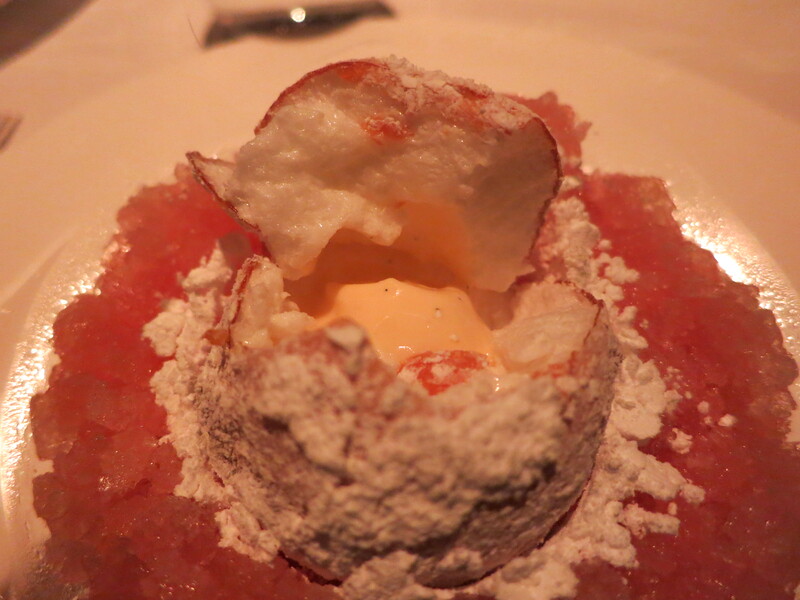 An inside shot of the snow egg once I had cracked the top of the egg…dreaming of this right now as I type this! So last Friday night, Mr Muscles decided to take me out for dinner as we hadn’t been out for a date night in a very long time. 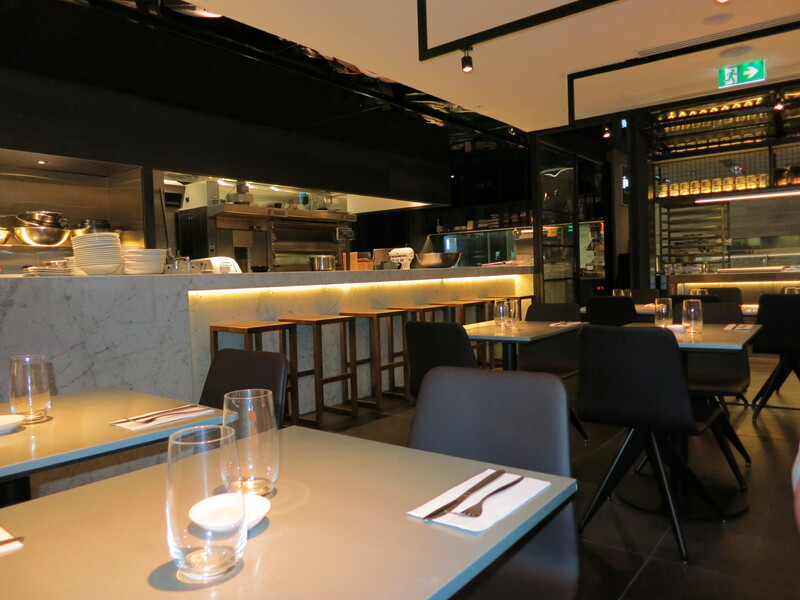 I had noticed that there was a new restaurant in Westfield near Price Line where the old Becasse used to be and really wanted to try it out so Mr Muscles decided to take me there for dinner that night. 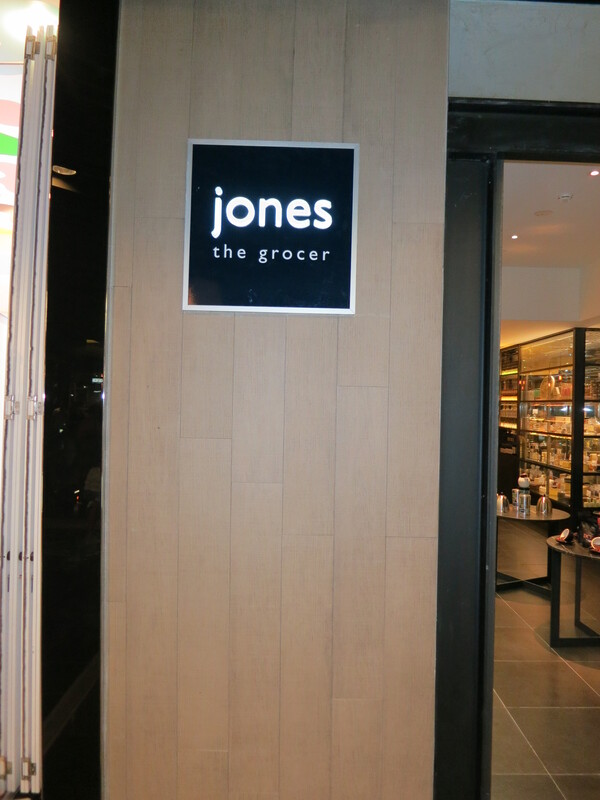 Jones the Grocer apparently used to be located in Woollahra but closed recently and moved to Westfield. 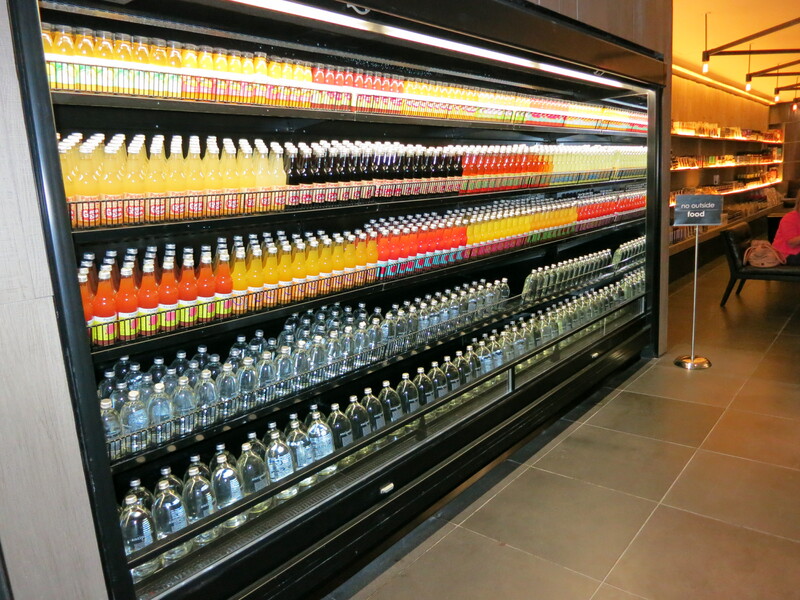 There is a grocery store on the side of the restaurant where you can purchase various grocery items and in front of the restaurant there are various delectable sweet treats to choose from such as vanilla slices, fruit tarts and various other cakes and desserts. But if this doesn’t take your fancy, they also bake fresh bread loaves that you can purchase daily baked fresh from their ovens. 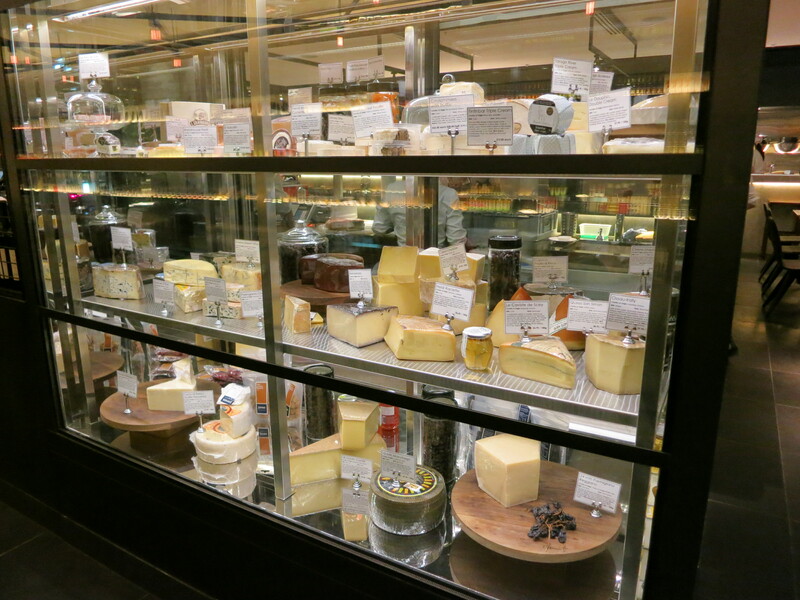 Furthermore, in the cabinets inside the restaurant, they have a variety of cheeses and various smallgoods that you can purchase. 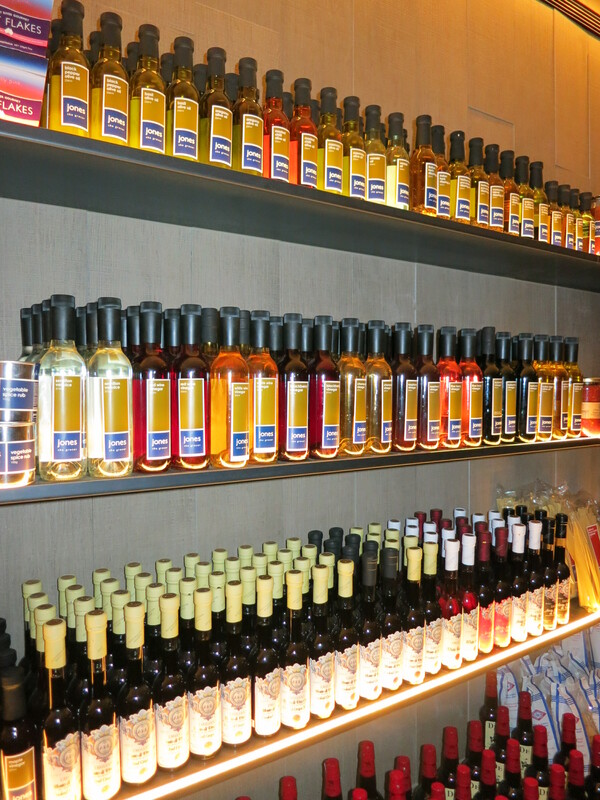 I feel like this place definitely has something for every type of taste bud. 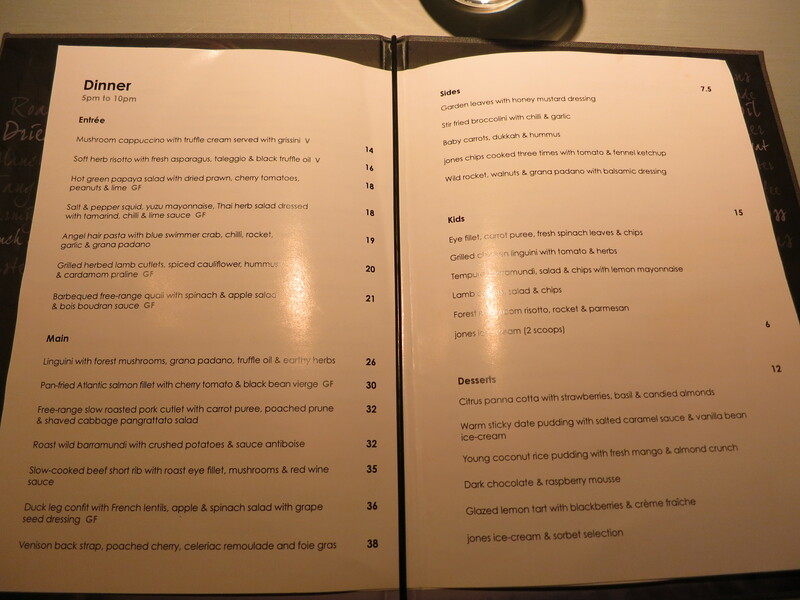 Mr Muscles and I decided that we should indulge for the night and decided to order 3 courses. I ordered the Mushroom Cappuccino aka fancy mushroom soup as I wanted something different. 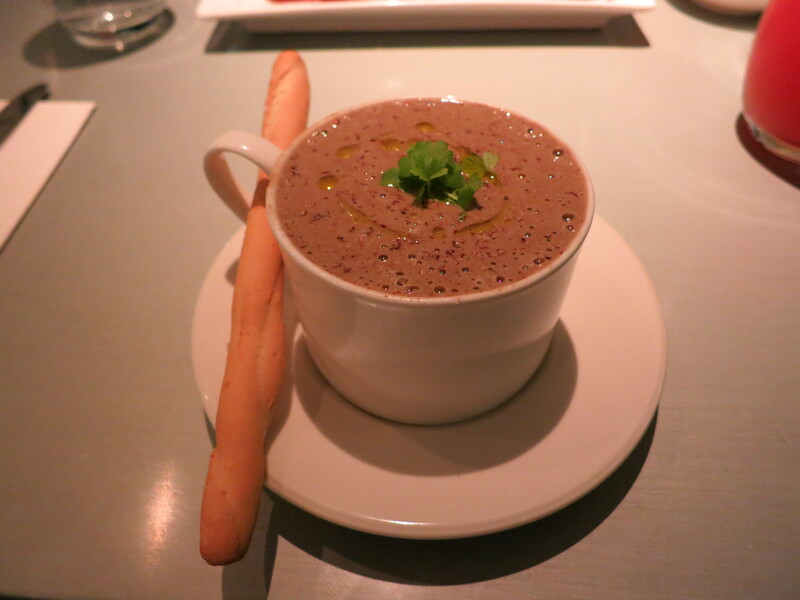 The soup was cleverly presented in a coffee cup and served with a grissini bread stick. I really enjoyed the soup despite the soup being quite heavy. This entrée was very decadent, rich and as you got closer to the bottom of the soup, there were lovely bits of mushrooms to chew on. Mr Muscles tried a bit of my soup and agreed that this was a really lovely entrée. Mr Muscles ordered the beef as his main and was not disappointed. 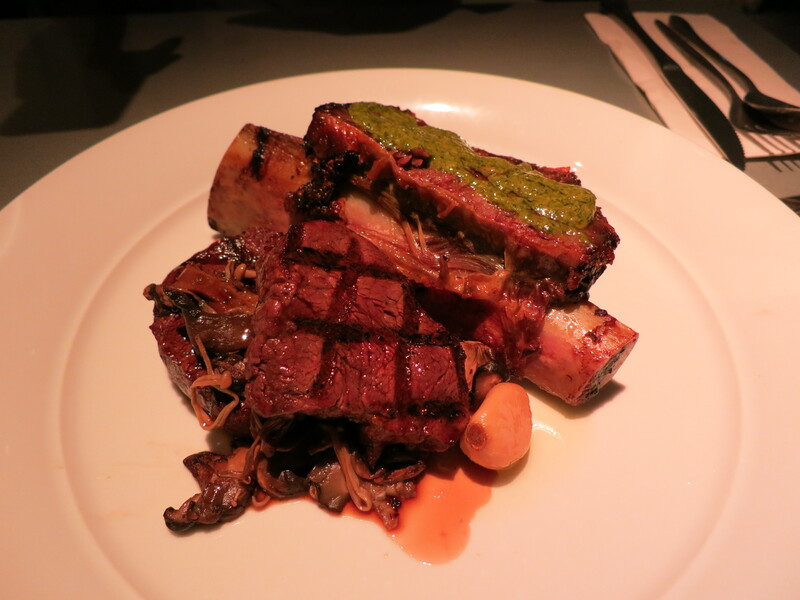 He loved everything about the dish from the tender eye fillet steaks to the melt in your mouth slow cooked beef short rib. There was a delicate and wonderful balance of flavours that really made the dish a success. Mr Muscles noted that the portion size was quite decent for a main course meal. The dish was also really well presented and Mr Muscles noted that he probably would order this dish again if we come back to visit this restaurant. 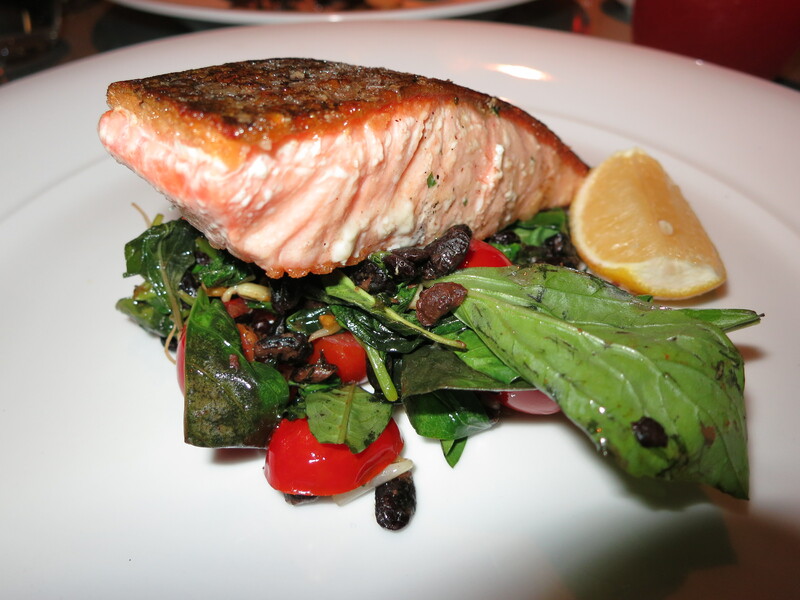 I decided to order the salmon as I wanted to have a lighter main to purposely give me more room for dessert as I had been eyeing out the dessert menu even before Mr Muscles and I had started eating. The salmon was wonderfully cooked with the skin on. My only qualm about the dish was that I thought that the accompaniments to the dish didn’t quite go together. The black beans were extremely salty and while the fish itself was not salty, each time I took a mouthful of the salmon and the black beans, the black beans seemed to over power the fish. Regardless of this factor, I still quite enjoyed my choice of main. I couldn’t wait for dessert that when the waitress asked if we wanted to order any dessert I immediately responded a bit too quickly. 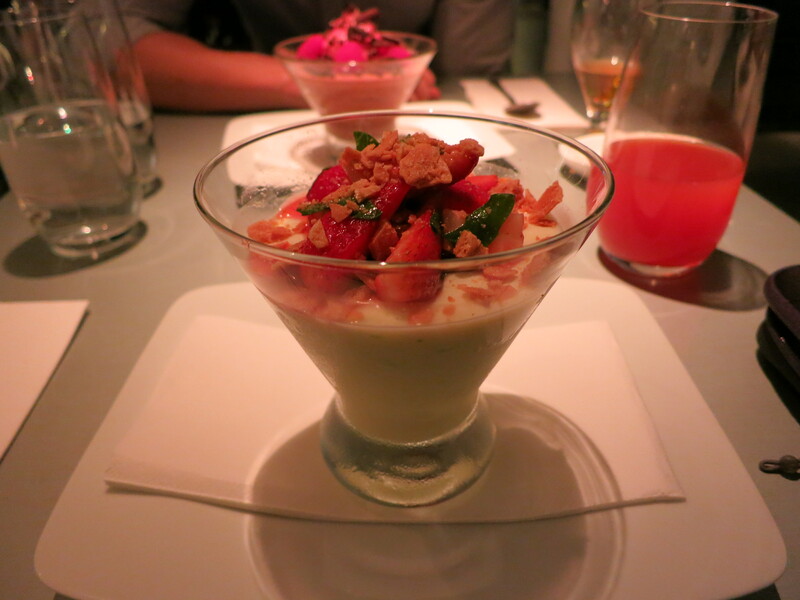 I knew what I wanted to order and decided to order the pannacotta as I love all things pannacotta and couldn’t wait to try out their take on the pannacotta. 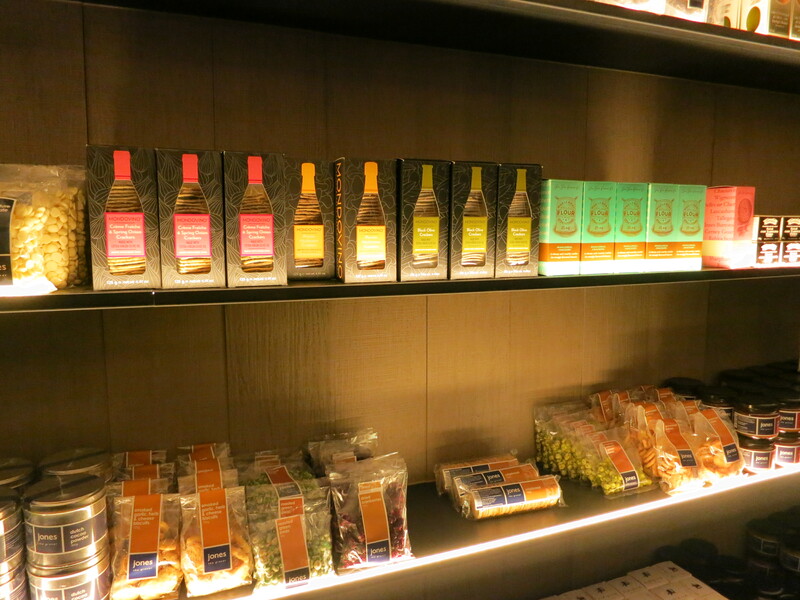 I had been staring at the kitchen area where the staff were making desserts all night. They had kitchen aids and they were prepping all the desserts at the time and it was really interesting to see what desserts they were making. 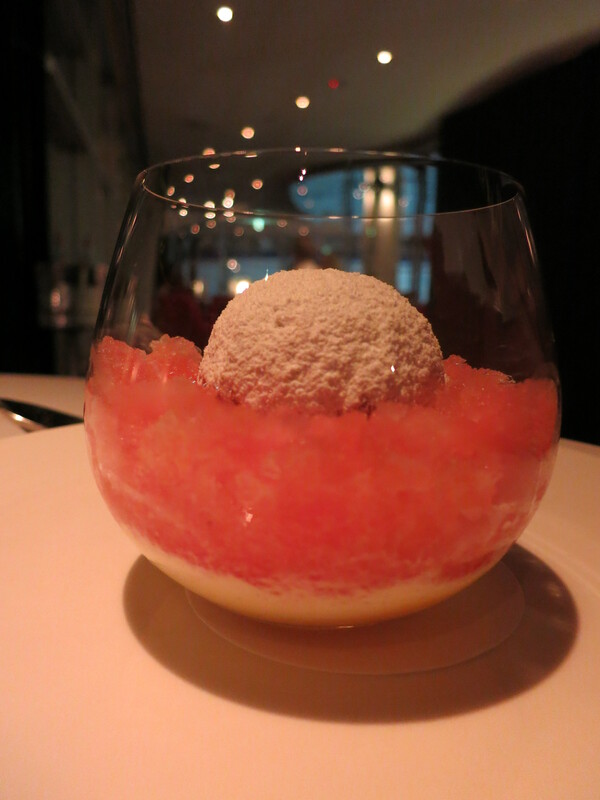 However, I was quite disappointed with my pannacotta only because the texture didn’t resemble a typical pannacotta. 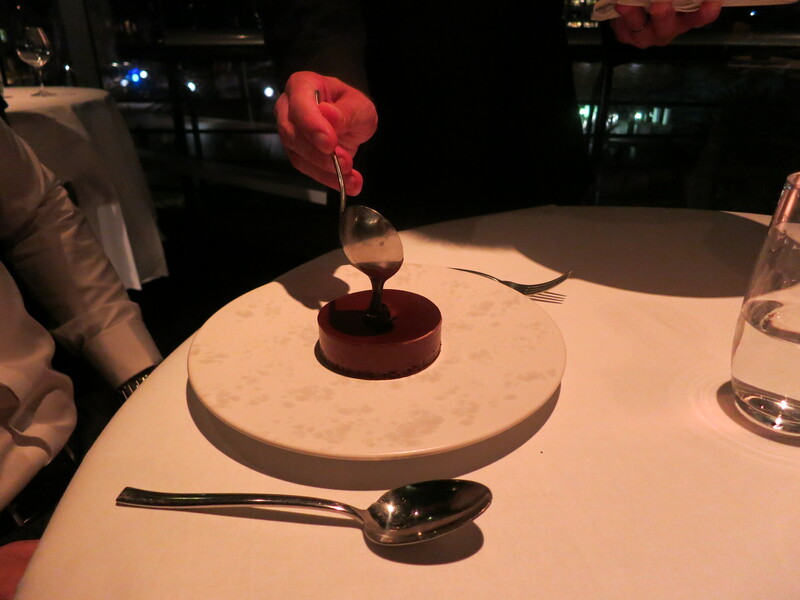 If anything, the pannacotta resembled more a creme caramel type texture. The pannacotta perhaps needed more gelatine or cream. 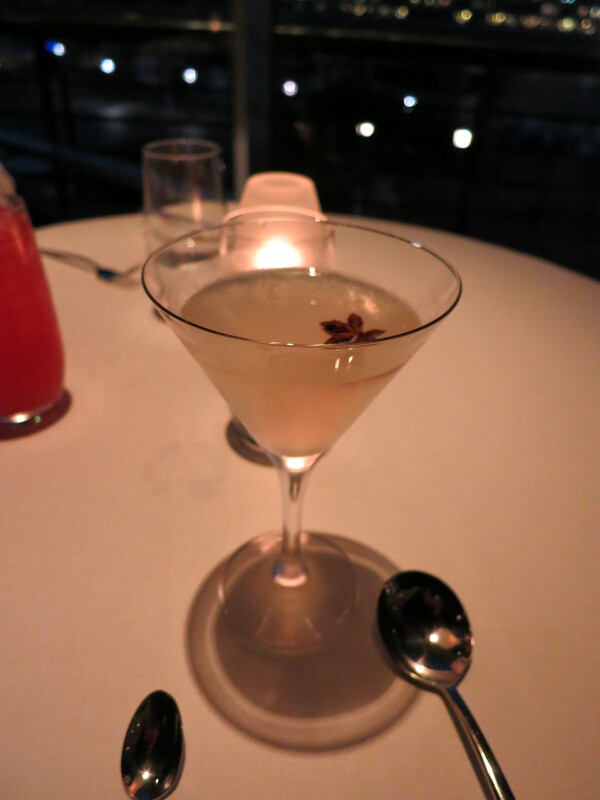 The accompaniments to the dish however were lovely and I really enjoyed the candied almonds. 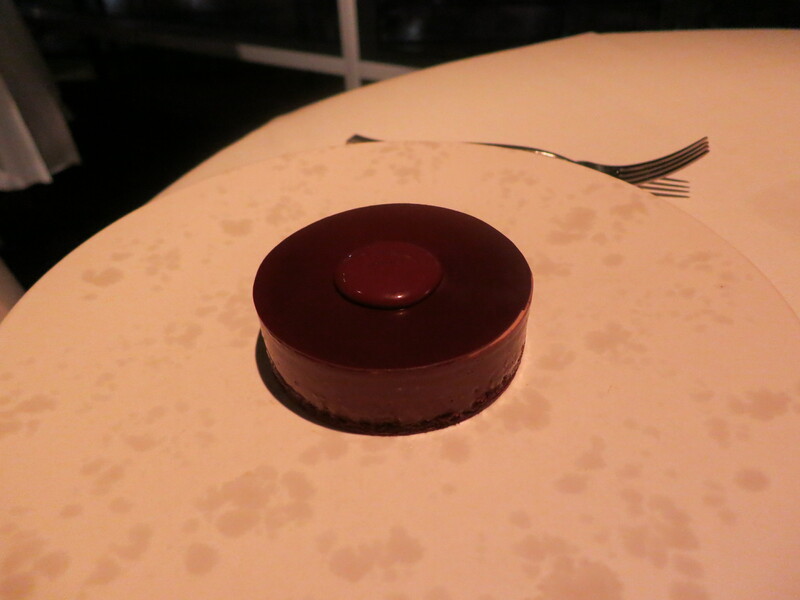 I still ate most of my dessert but wished that the texture had been different. Mr Muscles ordered dessert based on the fact that the knew I wanted to try out two desserts but to make me not feel as bad, he ordered one so that I could pick at his dessert while also eating mine…sigh me and my sweet tooth ;P I really had big time dessert envy when they brought his dessert out…the presentation of the dessert was really pretty and all the flavours paired really well together. 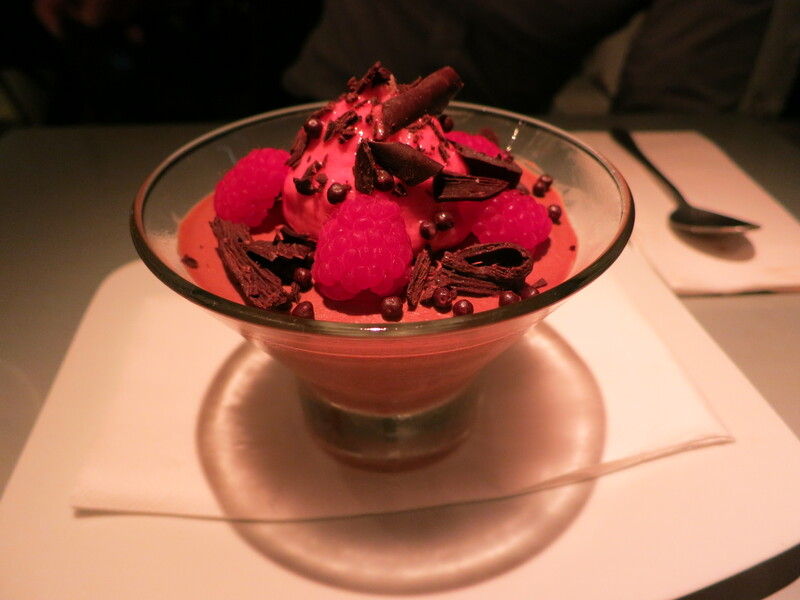 The chocolate mousse was decadent but light at the same time. It really was a great dessert and I ended up eating more of this dessert than my own. I’m definitely going to try the other desserts if we visit here again next time as I saw a lot of people ordering their home-made ice creams and sorbets. All in all it was a really great date night with good food. 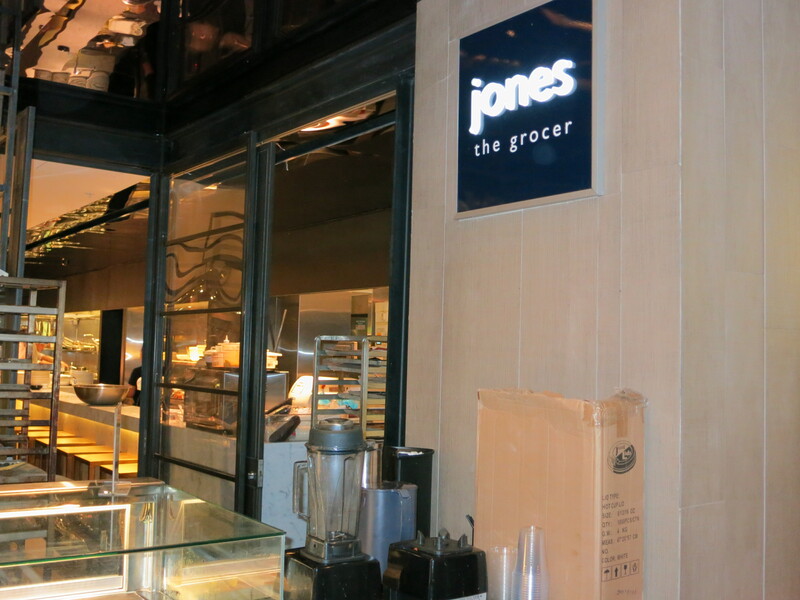 Jones the Grocer is still relatively new and opened up only last week but I can tell that it’s going to be quite busy soon. 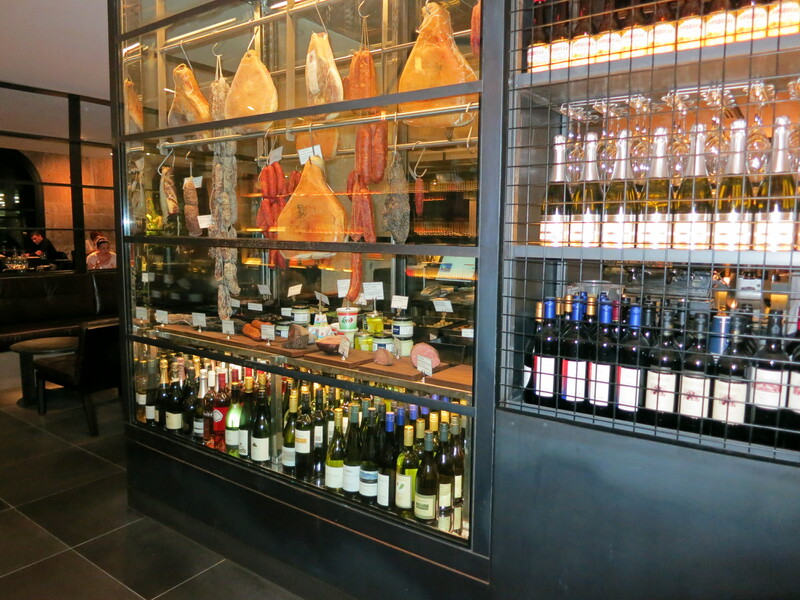 They don’t accept bookings for tables of under 6 people but you can always walk in and try your luck like we did. There was no wait when we walked in as the restaurant was still quite empty at the time we went. 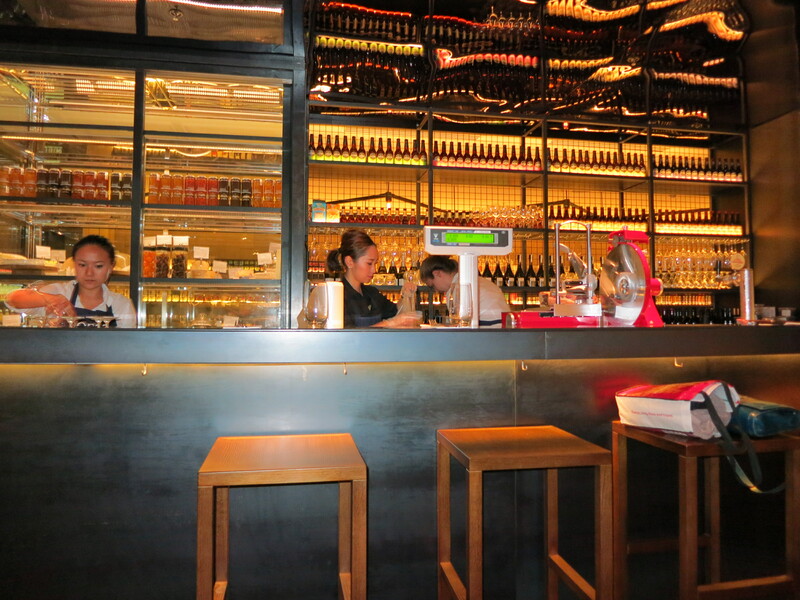 You should definitely try out their desserts at the front of the restaurant. 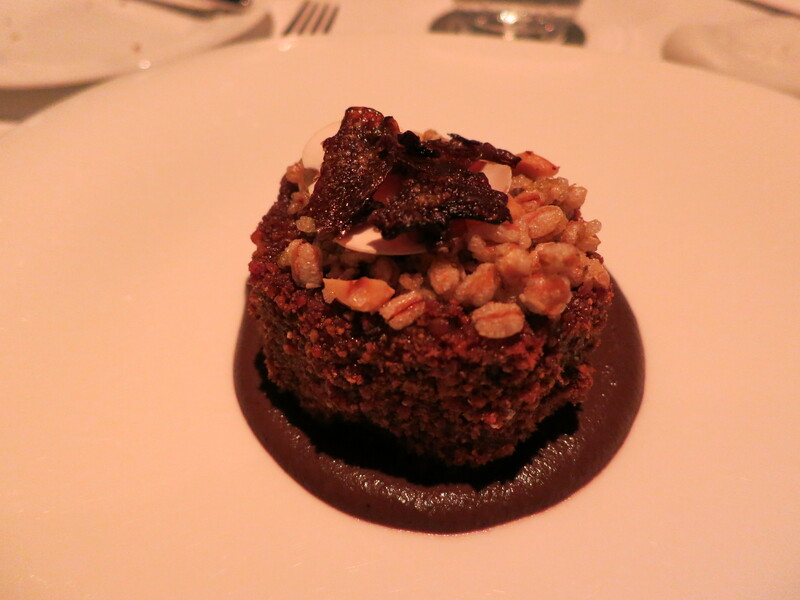 I tried a lovely quinoa and date cake from there and really enjoyed it. I know this is going to be a massive week of eating as Mr Muscle’s birthday is tomorrow and we have a birthday dinner on Wednesday to celebrate. Stay tuned for that post! I’m sorry about the delay in blogging but it has been a really jam-packed week starting on sunday where we won a semi finals and then on Tuesday where we won another semi finals in basketball…it’s been a great week so far full of really great matches and I’m really looking forward to the finals this weekend and next week. 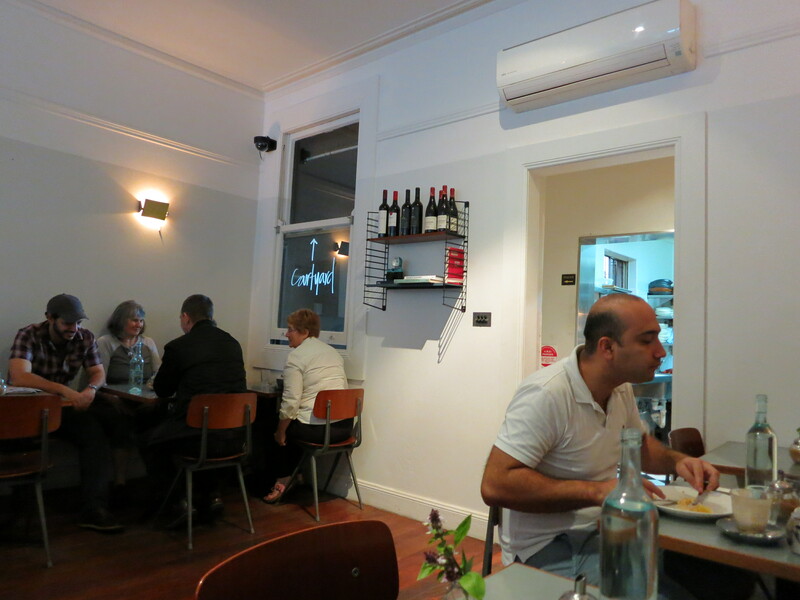 This is just a short post on a cafe I visited last weekend on my way to basketball training. Mr Muscles and I didn’t know where we should eat as time was limited before training. 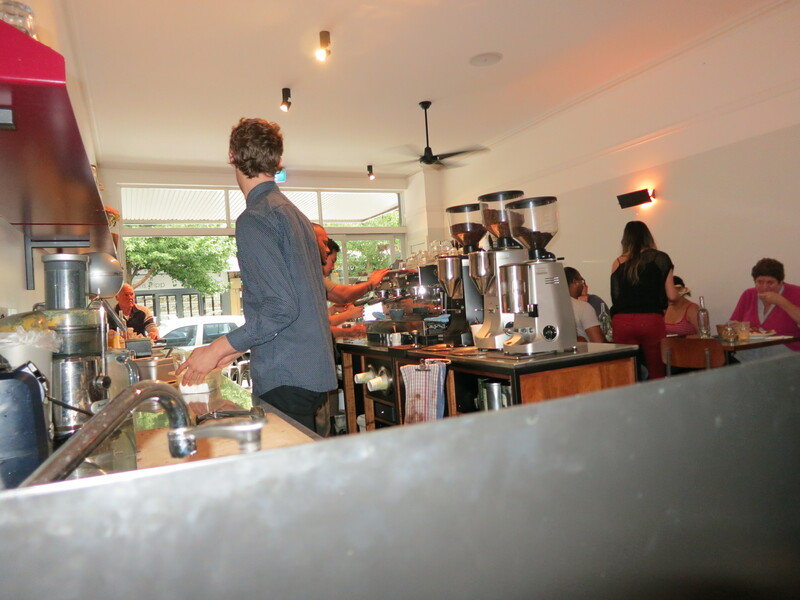 We decided to go to Summer Hill as Mr Muscles had heard from his workmates that there were a few good cafes in the area. We decided to try our luck at Plunge Cafe. 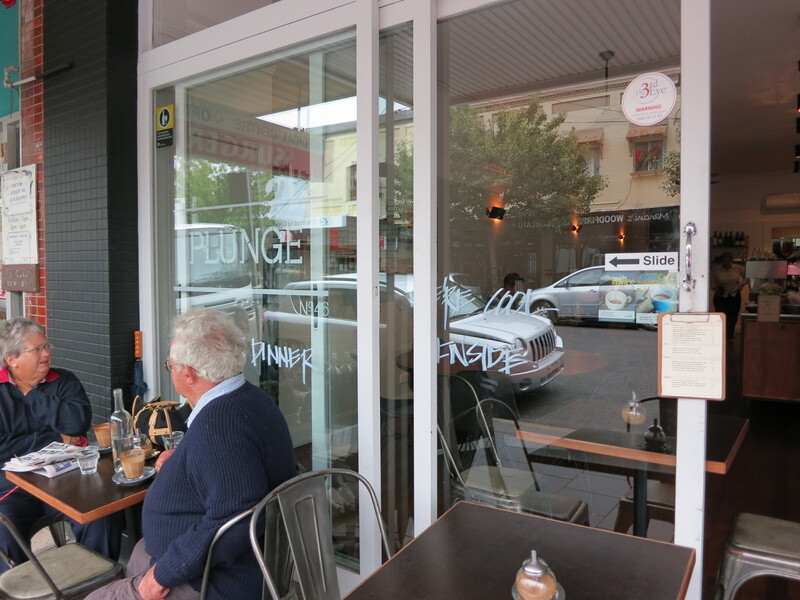 Plunge cafe is a small cafe located among various shops in summer hill. It’s quite a small cafe so you might blink and miss it if you drive too quickly. We were in luck as we were searching for parking, we coincidentally found the cafe right in front of where we parked the car. Plunge cafe has quite a cozy settings with quite a few chairs and tables but you can tell the place gets really packed quickly. 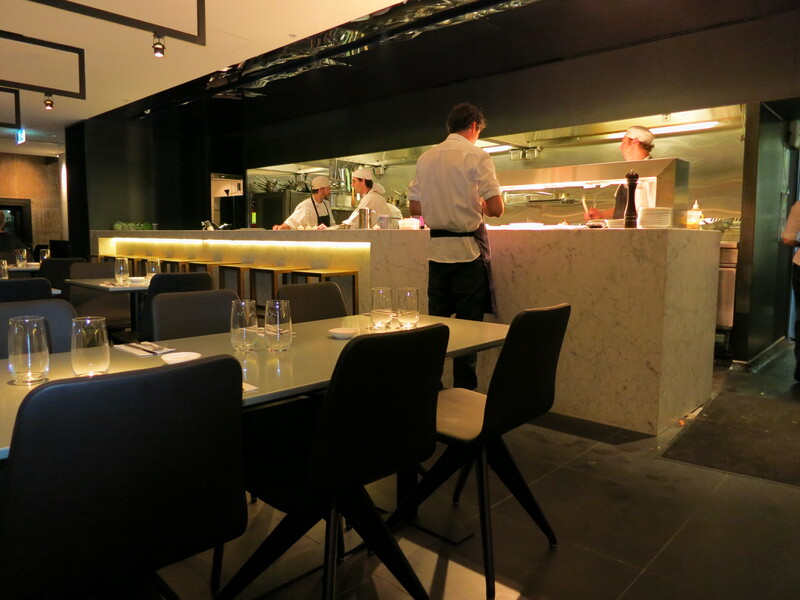 We were lucky to get a table as it was still rather early. 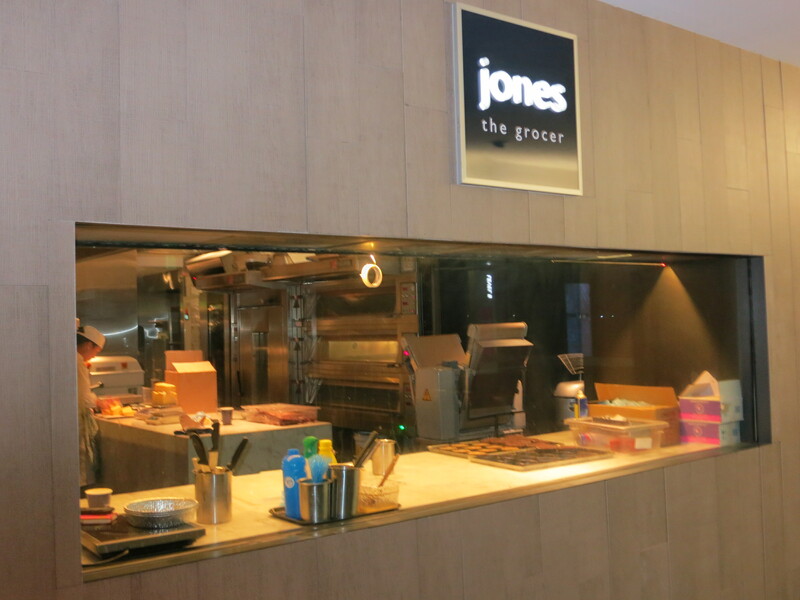 What I liked is that they serve home-made muffins at the front near the counter so you can either take them away or eat them there. As we sat down, we noticed a diner who was eating a muffin at the table. I noticed how large the muffin was and knew I probably wouldn’t have been able to finish it off so decided to not order one. I think the diner was thinking the same thing because shortly after she took her plate to the counter and asked to takeaway the rest of her muffin. The great thing about this cafe is that breakfast is served all day just the way I like it. 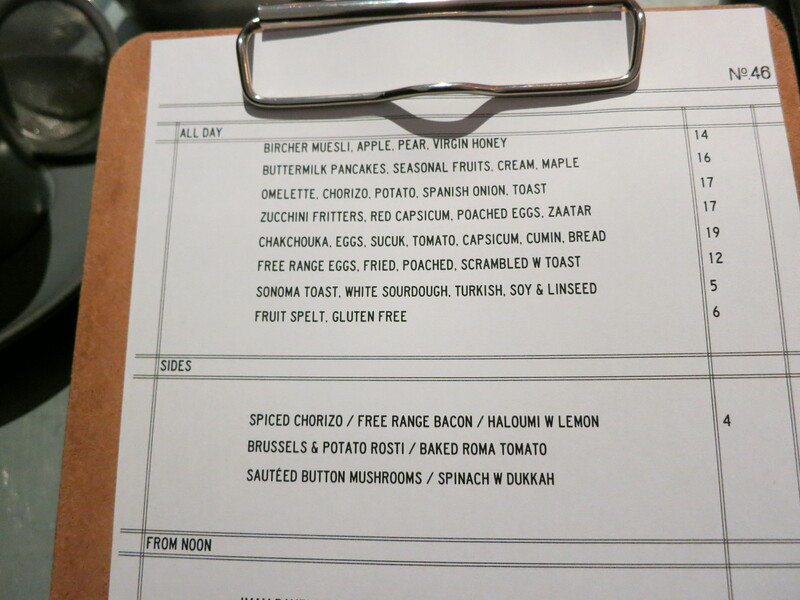 It’s quite a short menu for breakfast but with quite a bit of variety. They also do specials of the day and I think on the day the specials were a slice of their banana and blueberry loaf or the choice of salmon Benedict instead of the usual ham Benedict. I could tell Mr Muscles wasn’t too happy with his meal choice due to the portion size of his food. I think he was hoping for a much larger serving size. He gobbled his meal up quickly but eyed my pancakes shortly after so I was more than happy to share my serve of pancakes with him. He said that he enjoyed his meal however there was nothing too special about his dish. I was so excited about ordering pancakes that I couldn’t wait to dig in once the dish was placed in front of me. Once again I had similar remarks to Mr Muscles. The dish was quite enjoyable however there was nothing memorable about it. 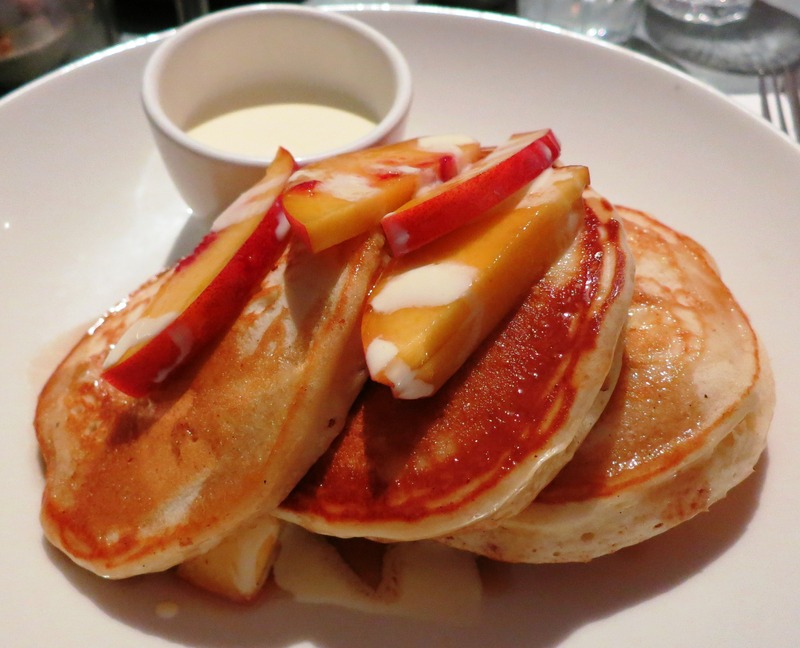 I think I’ve become more picky after eating so many different kinds of pancakes at various cafes across Sydney. These pancakes reminded me of the short stacks I used to order at Pancakes at the Rocks. The fruit was fresh though and it paired nicely with the hint of maple and splashes of cream. I gave Mr Muscles a pancake to try and he agreed with me. Whilst the pancakes were lovely and light, they were missing something compared to other pancakes I have tried. We left the cafe feeling just full enough but not quite satisfied. 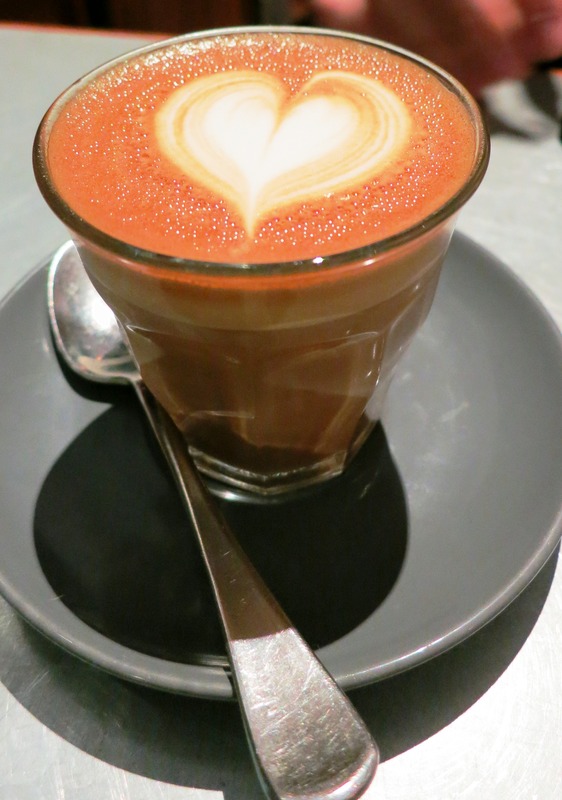 Perhaps it’s one of those cafes we will need to come back and try again when we aren’t so rushed for time. Look out for some upcoming recipe posts…I’m definitely planning on baking on the weekend when I have time…and Mr Muscles birthday is coming up next week..so look out for a restaurant post next week! 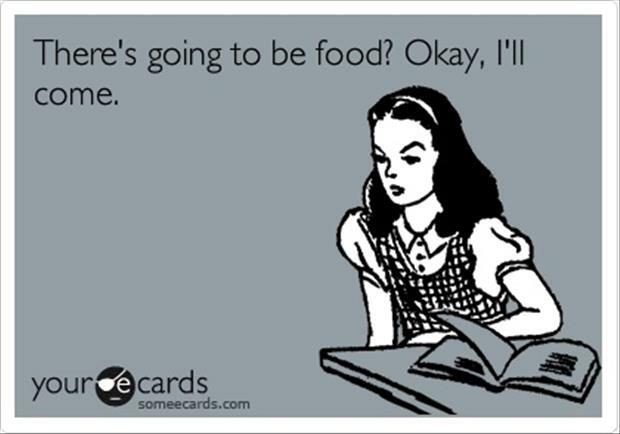 This is just a quick message to all my readers to gather how much interest there might be if I do a one day bake sale in the coming months. I have decided to do a bake sale so that I can share with all of you and my dear friends and family, various baked goods that you may have seen on some of my blog posts and various other baked treats that I have experimented with over the years. Please drop a comment if this is something you may be interested in coming to. I just want to see how much interest there is before I start organising the bake sale.